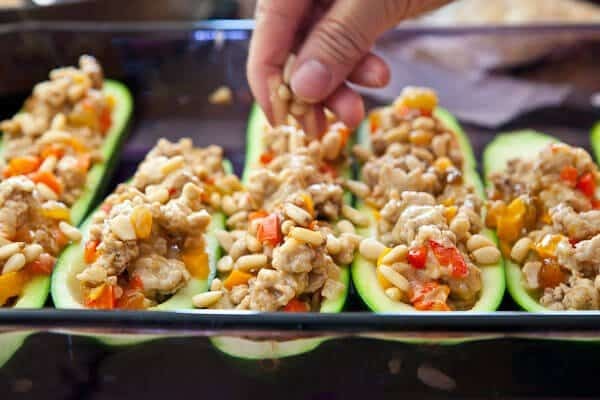 There are a gazillion things to do with zucchini, but making stuffed zucchini boats are has got to be the most fun way to eat, and that’s by unanimous vote from all members of the family. First things first, you’ve got to make the boat. Slice each zucchini in half, lengthwise. Use a teaspoon and start at the big end of the zucchini. Carefully dig your spoon in without piercing the skin. Now turn your wrist as if you were using a melon baller and scoop out just one section. Continue doing one scoop at a time – be gentle and don’t worry about scooping every single bit out – just a good chunk of flesh. Don’t worry about it being even either, we’ll take care of that later. I’ve scooped 4 times. Now it’s time to make the zucchini boat even. 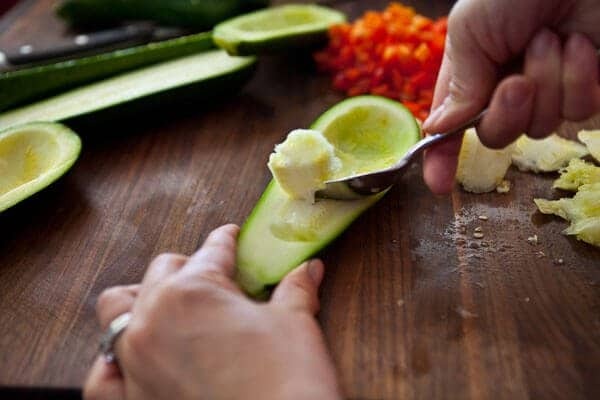 Hold the zucchini boat and turn the spoon over and gently scrape to even out the hollow. Scrape out all the seeds. The key to this dish is to first microwave the zucchini with some water until it’s almost cooked through. I used a glass Pyrex dish – microwave and oven safe so that i don’t have to transfer dishes. 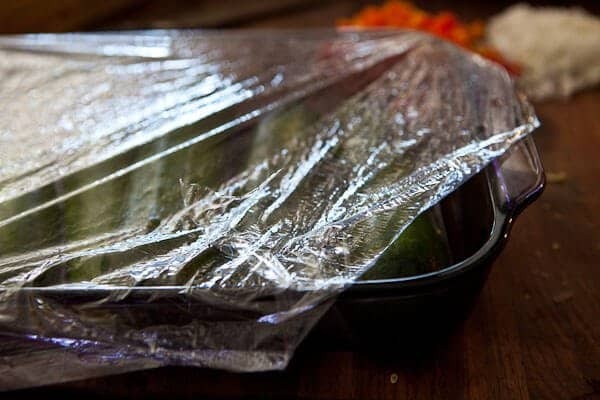 Cover with plastic wrap, leave an opening and microwave. 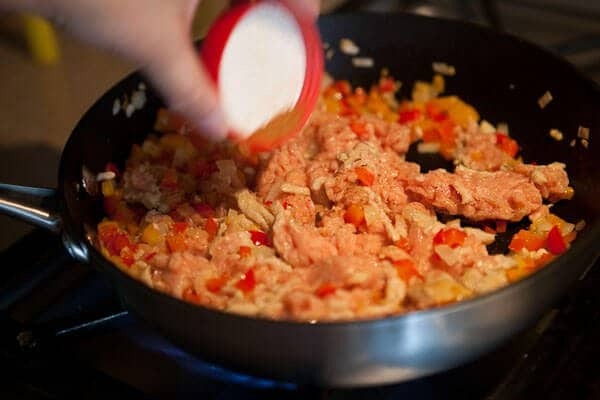 In the meantime, saute the bell peppers, onion, garlic, ground chicken. Add the cinnamon, salt and pepper. 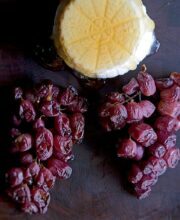 And of course the cheese. 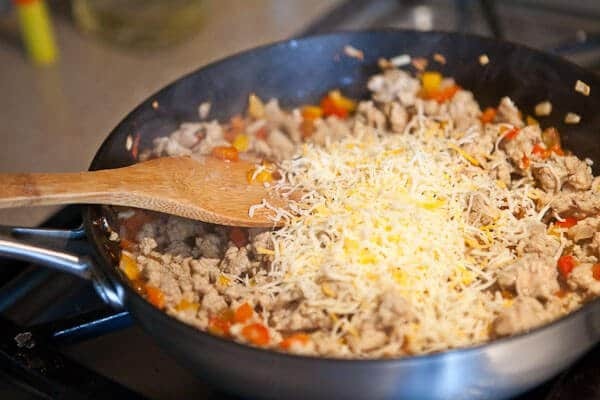 The cheese helps the mixture stick together as well as give it a great flavor. Mix it all around and now the stuffing is done. 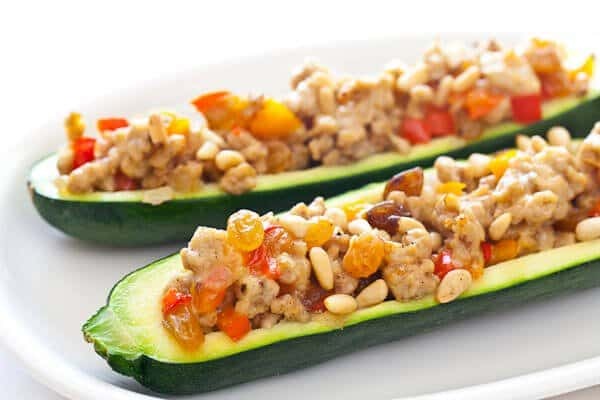 Fill the cooked zucchini with the stuffing. Oh yum. Can you smell that? Top with pine nuts and bake for 10 minutes. Please promise me you’ll make this recipe!?? You’ll love it. It’s fun to eat (my kids just picked up the entire boat and ate by hand), savory from the cheese and chicken, sweet from the raisins and nutty from the pine nuts. 1. Cut zucchini in half lengthwise. 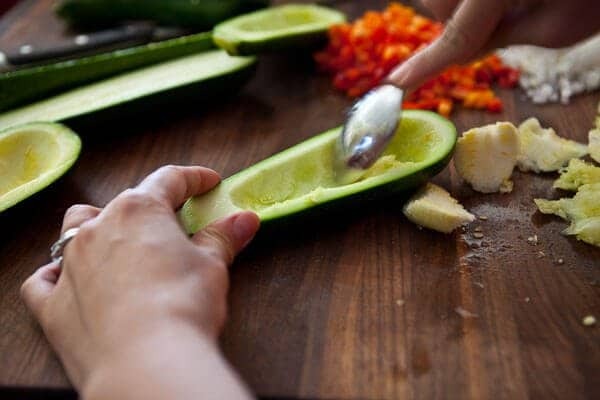 Using a small spoon, carefully scoop out flesh and seeds, leaving a 1/4-inch-thick shell around edges. Discard flesh and seeds. 2. Place half of the zucchini, cut-side down, in an 11 x 7 x 2-inch glass baking dish. Add 1/2 cup water and cover with plastic wrap, venting one corner. Microwave 4 minutes. 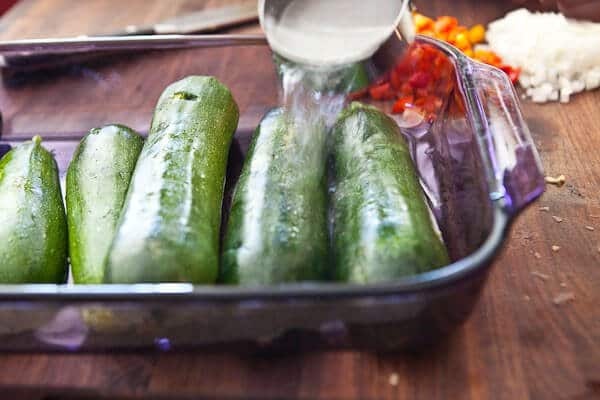 Place cooked zucchini in a large baking dish. Repeat with remaining zucchini. 3. Meanwhile, heat oven to 400 degrees F. In a large nonstick skillet, heat oil over medium heat. Add bell pepper, onion and garlic; cook 5 minutes, stirring occasionally. Crumble in chicken. Stir in raisins, salt, pepper and cinnamon. Cook 5 minutes, stirring occasionally. Turn off heat and stir in cheese. 4. 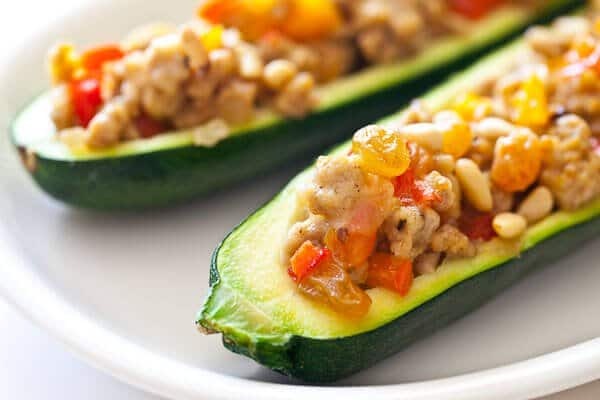 Fill each zucchini half with about 1/3 cup stuffing, then sprinkle the pine nuts over tops. Bake at 400 degrees F for 10 minutes or until the zucchini is cooked through. Alright, my lens-lovin friends! What I love about this lens is that it’s got the world’s largest zoom ratio of 15X zoom, which means the lens covers an angel of view equivalent to that of a 28mm wideangle to a 419mm ultra telephoto with just one lens. 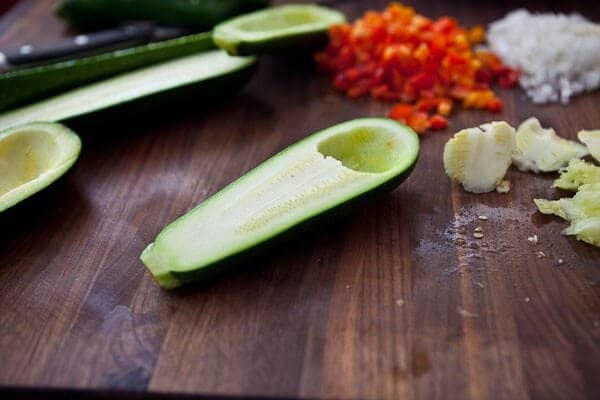 This is a great travel and food lens – because you can take a panoramic shot of the beach as well as closeup shots like the zucchini (take a look at the 2nd shot of finished dish). There’s a lens for Canon as well as Nikon and retails for $629, but there’s currently a $150 rebate so you can grab this baby for $479. 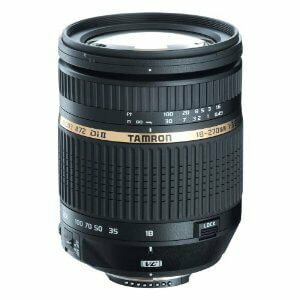 More info on the lens at Tamron’s site. GIVEAWAY CLOSED — Congrats to Taylor of Taylor Made! Fried zucchini with garlic-dill yogurt sause. Just cut the zucchini into rounds, dip them into flour and fry. Serve them warm with some yogurt mixed with mashed garlic, chopped dill and salt. Also zucchini fritters with feta cheese served with the same sause. Zucchini fresh out the garden off the vines, so sweet and tender. Cut it up and eat fresh. Also, in a gratin or sliced and saute with EVOO, salt & fresh cracked pepper. Baked Zucchini with Parmesan Cheese is my favorite recipe. There’s a restaurant in a place I used to live that sold fried zucchini with a ranch-type dipping sauce. I actually craved it when I was pregnant. Well, I still crave it. haha! I’ve always loved zucchini bread, and one of my favorite recipes for it actually came from a vegan friend of mine – I was shocked how fluffy and delicious it turned out even without eggs! 1. Preheat oven to 325 degrees F (165 degrees C). Grease and flour two 9×5 inch loaf pans. Whisk together the flour, flax seeds, salt, baking soda, cinnamon, baking powder, and arrowroot in a bowl until evenly blended; set aside. 2. Whisk together the applesauce, white sugar, brown sugar, vegetable oil, and vanilla extract in a bowl until smooth. Fold in the flour mixture and shredded zucchini until moistened. Divide the batter between the prepared loaf pans. 3. Bake in the preheated oven until a toothpick inserted into the center comes out clean, about 70 minutes. Cool in the pans for 10 minutes before removing to cool completely on a wire rack. My husband is not a big zucchini fan so I do not make it as much as I would like to. I really like fried zucchini strips dipped in a cucumber ranch dressing. They are so good and so easy to make, slice, batter and fry YUM!!!! I simply like to sautée it in olive oil with garlic, thinly sliced onions and red peppers. YUM! Our favorite zucchini dish is baked zucchini with tomatoes, onions, and olive oil. Yummy! I would love to add this to my camera bag. SO FUN! Oh and I don’t have a favorite recipe. I love to just steam it! I’m quite fond of baked zucchini sliced in half, covered in Parmesan cheese, black pepper, a pinch of salt, and just a drizzle of olive oil. I like baked zuccini stuffed with 3 cheeses. Great giveaway– thanks!!! my fav. zucchini dish is sliced zucchini stirfry with tomato and red onions. A little hoisin sauce and salt/pepper! Fried, along side a yummy tuna melt or grilled with salt and olive oil, along side some homemade Korean BBQ. YUM! I like shrimp & feta stuffed zucchini! I am an extremely simple zucchini lady. I love sauteed zucchini with caramelized onion and garlic with just a tad bit of salt and pepper…Topped off with parmesan cheese. I love Zucchini in a roast vegetable medley with tomatoes and herbs with a side of rice! Just delicious!! tweeted using the button at the bottom of your post. The only way I will eat zucchini is in warm zucchini bread with butter! My favorite is zucchini bread. I love zucchini bread – but these look great. Always looking for new dinner ideas. Beautiful shots with that lens. I’m a fan of fried breaded zucchini as an appetizer. It’s so good. What a versatile vegetable as appetizer, main, side dish or dessert! I think of my Mom-Mom Mary when I have zucchini fritters! I love grilled slices of zucchini brushed with olive oil. Zucchini bread is the most nutritious dessert I know ( after chocolate)….must try your recipe for dinner one night, thank you! I love zucchini fritters with a yogurt sauce! zucchini with tomatoes over bow tie pasta…. saute 3 small zucchini in olive oil and garlic until crisp tender, add 1 sliced onion and two cans of diced tomatoes, simmer for about 7 minutes, cover with grated parmesan cheese and pop under the broiler until golden brown, serve over bow ties with a salad and glass of red wine! I like to saute zucchini and use it in tacos. Thanks! There’s nothing like zuchini tempura! This lens could only help my photography skills…right? Here – I just now tweeted too. Lovely pics Jaden. Baked Zucchini with some yogurt dip is my all-time fav snack. I’m loving this recipe! It can be quite difficult to sell zucchini to the wretchedly fussy teens in our house. The son has been known to leave the table with it in his pockets to avoid eating it. My personal favourite way to eat zucchini is to slice it very thin with a potato peeler and just toss it with some lemon juice, salt, pepper and extra virgin olive oil – South Australian, of course!! found you via the lens give away round up! love a good zuc recipe, especially when you get a bumper crop going. my personal favorite way to use up those zucs has to be this one that I posted about over the summer, um hello chocolate goodness! Thanks for sharing and fingers crossed! check out this amazing camera lens giveaway!!! http://ow.ly/3hCXd! a)lovely lovely blog! glad to have found you! b)I love zucchini used in a frittata instead of potatoes! c) I will definitely try your stuffed zucc recipe! Zucchini bread– for breakfast and for dessert. De-licious. I make a summer salad with couscous, chopped zucchini, tomatoes, onions, olives, and capers. Lemon tarragon vinaigrette gives it a light fresh flavor. I also sometimes add a little feta cheese or grilled chicken breast. You can substitute rice or orzo pasta for the couscous, add other fresh vegetables such as peppers, cucumbers, etc., and use your favorite vinaigrette. I love zucchini cake!!! So easy and sooo good! Great post, and as always, great photos. I’m a lover of zucchini – raw. I just cut it into strips, usually with yellow squash, and just munch on it much the way people do with carrots. A friend of mine loves to put balsamic vinegar and some fresh herbs and grill it, but I can never make it as well as he does. Zucchini bread is my favorite! I’m a purist…I like my zucchini roasted, a little olive oil and salt. Love zucchini walnut bread…SO GOOD!! we love a zesty citrus zucchinic crudo, perfect detox for this time of year. I love zucchini lighty salted with some pepper and olive oil on the grill… I’m getting hungry thinking about it! I love zuchini in soup! My favorite zucchini dish is Zucchini bread. But I also have a recipe for Zucchini Soup that is delicious. My Mom’s generations-old zucchini bread recipe is guarded more tightly than KFC’s secret spices. I love roasted and grilled zucchinis and chocolate chip zucchini bread! I like my zucchini plain & simple, roasted with garlic. I love chocolate zucchini bread, but also love stuffed zucchinis! Thinly slice fresh zucchini. Sprinkle with olive oil, add minced garlic and shallots. Sprinkle Borsari original over all ingredients. Transfer to grill pan and lightly sautee over hot coals. I love these Turkish Zucchini Fritters with garlic yogurt sauce. My favorite Zucchini dish is Mediterranean Zucchini Spread.. try it out – you can eat it alone or with Zucchini Bread! Preheat oven to 400 degrees. Rub zucchini and onion with olive oil and place on baking sheet. Bake about 25-30 minutes, until both have softened, turning once. About 15 minutes into the cooking time, add garlic to sheet. Remove from oven, and cool just enough to be able to handle. 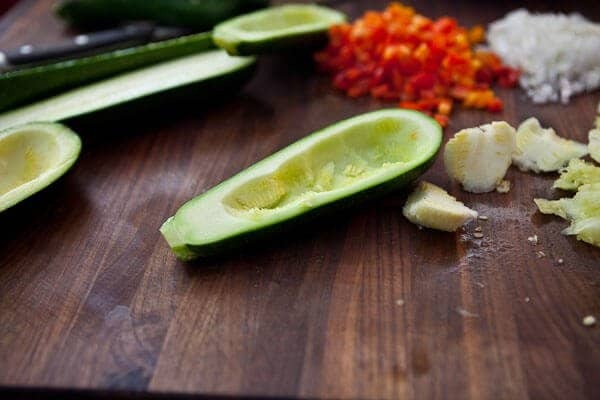 Place zucchini into a food processor. Cut onion into chunks and add to processor with garlic. Process until desired consistency. Add oil, vinegar, lemon juice, parmesan, salt and pepper. Pulse until well mixed. Add cilantro and briefly pulse. Adjust seasonings as necessary. Serve warm or cold. My fiance’s late mother made a scrumptious zucchini bread. It was so moist and delicious. I use a 35mm to take my food pix right now, but would love a more versatile lens. I could use it to take a picture of my own try at zucchini bread! I’m taking a photography course starting in January and this would be a luverly addition to my equipment!!! My favorite way to eat zucchini is stuffed the way my mom makes it. Hollow out the pulp, mix it with ground meat, onion, spices and stuff. Cook in a thick tomato based broth – excellent! I looove grilled zucchini! Slice zuke lengthwise 1/4″-1/2″ thick. Marinate in olive oil (or any oil good for grilling), soy, garlic, salt and pepper…you can really use any spice combo, etc. Grill ’em up! Yum! My favorite zucchini recipe is a simple one, fried zucchini (my boyfriend’s family calls them space cookies). The usual, flour, egg, then some italian breadcrumbs, deep fry, sprinkle with grated parmasean salt and pepper. Yum! My favorite zucchini dish is the Zucchini lasagna OMG is so delish. In my house is so hard to feed vegetables, but when I make the zucchini lasagna, cut them very thing my son doesn’t even notice. Of course flavor is great, with homemade tomato sauce and good parmesan cheese and mozzarella. Mummy!! Pretty much anyway you can make it. Bread for sure and grilled too! I like grilled zucchini with olive oil, salt, and pepper. Sauté garlic & sausage with onion. Add zucchini & whole tomatoes. Serve with artisan bread! Our summer favorite! I love zucchini and goat cheese pasta. Yum! Love zucchini pancakes. Just shred mix with a little egg and flour to bind and shallow fry in canola oil. I will put the fresh zuccini into the curry soup and add colored bell pepper, green onion – meat is optional. Stop the cooking process while everything still crunchy. Mmmmm I LOVE zucchini especially pickled, or in a quick bread or cut into thin strips and used as a substitute for pasta. Drool. Hmm, my favourite zucchini recipe would definitely have to be in cake… it’s the best!! But I think I’m going to be trying these zucchini boats next. How wonderful, an awesome recipe & a free lens! I’d have to say this amazing Tortilla Soup recipe chock full of zucchini!! I love giveaways and I love taking pictures and I love zucchini coated in panko and baked in the oven! My favorite zucchini dish remains the zucchini patties my Dad made for me when I was a kid! 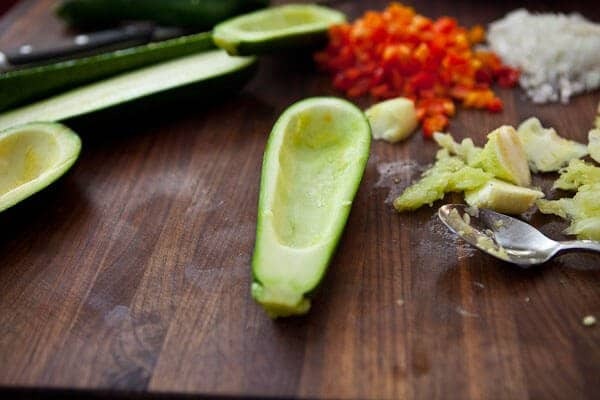 My favorite zucchini recipe would probably be zucchini nachos which my wife made last night! I put Zucchini slices drizzled with olive oil on pizza all summer long, but my favorite zucchini dish is the old staple – Ratatouille. Roasted, then sliced and tossed with some pasta. Drizzle olive oil and done! I love zucchini bread with a lot of cinnamon. But in the summertime, zucchini is also fab cooked in a packet on the grill with olive oil, garlic and a bit of sea salt and pepper. Zucchini cut, wrapped in aluminum foil packs with cherry tomatoes, garlic cloves, rosemary and a bit of butter or olive oil on the grill! One of my favorite summer side dishes. Cheezy zucchini shreds…grate it, stir fry in some butter and add some cream cheese and s/p. Delish!! One of my favorites is Ina Garten’s zucchini pancakes which I will be making tomorrow night for the first night of Chanukah. Fried Zucchini topped with homemade yogurt & garlic sauce! Zucchini flax bread. Moist and delicious. Mmmm, zucchini!! I like to slice it thinly, lightly roast it with olive oil, Italian herbs and garlic, top with Parmesan, and eat like pasta! I love to make zucchini bread or muffins. In the summertime though, one of my favorites is grilled zucchini with a little olive oil, salt, pepper and thyme. Zucchini gratin is my favorite! Zucchini bread. Without a doubt. I love my zucchini strips deep fried! I LOVE zucchini bread. It’s really simple, and everyone loves its natural moistness. I could eat it all day! I just love it plain roasted with olive oil and little salt and pepper. I never was a fan until I had it this way. Sometimes less is more. Please let me win the lens!! I’m kind of plain … love the fried zucchini chips! My dad’s zucchini fritters. Unbelievably fantastic! It’s either fried zucchini or grilled with a little parmesan melted on top, but these boats look like a winner!!! My family used to grow zucchini when I was younger, so during the summer we had plenty of zucchini. My favorite recipe would probably be as simple as steamed zucchini. Zucchini bread is in a close second. Strangely, I love making zucchini crisp! It tastes just like an apple crisp! I love all types of zucchini recipes, but my fave would be plain and simple — slices in planks, or tranches, drizzled with olive oil and balsamic vinegar, sprinkled with salt and ground pepper, and grilled! Honestly my favorite zucchini dish is just roasted zucchini. Next favorite is fried zucchini, crispy breading and a lovely marinara sauce for dipping! My favorite zucchini dish is one my grandmother always made. There isn’t a recipe just eons of watching her. Cut the zucchini into reounds. Slice and onion thinly. Chop garlic. Over a low heat cook until every thing is cooked doan and beginning to caramelize. Cook pasta – a short pasta is best for this. I add a little vegetable broth the the zucchini at the end. add in the poasta, a little pasta water to thicken. Voila. Dinner. My favorite is in a good stir fry. Also loving the chocolate zucchini cake that my local coop – Tidal Creek cooperative food market makes, but no clue on that recipe. I think its magic. I love making chocolate zucchini pancakes. Has to be just plain ole comfort Zucchini bread! This is a family favorite in our house. This serves 2, but you can adjust it to meet your family’s size. Great on a hot summer day! 1. 1 Cook noodles according to package directions. 2. 2 Drain and rinse in cold water. 3. 3 Place in a bowl; add cucumber and onion. 4. 4 Combine remaining ingredients in a jar with a tight- fitting lid; shake well. 5. 5 Pour over noodle mixture and toss to coat. 6. 6 Cover and refrigerate for at least 1 hour. i like fried zucchini strips! with horseradish sauce. Zucchini Bread — pretends to be healthy and tastes delicious! Zucchini tempura is probably my absolute fav but I also like zucchini bread and cookies too. Sorry, but I hate zucchini!! But I do love photography, and I am dying for this lens!! I too love zucchini bread. I love zucchini raw, cut in strips – I add them to salads, slaw and for veggie dipping. Thanks for the chance to win this great lens! That would be so exciting! My favorite zucchini recipe is a simple Italian family recipe from my husband’s late mother: sliced zucchini sauteed in olive oil with garlic and a bit of chili pepper, salt and pepper until translucent. It can be eaten as a side dish, or used as pasta sauce and is delcious! Oh, that lens! Too exciting! That is my very favorite way to eat zucchini. Wow! I’d have to say zucchini bread since I have it on the mind after it appeared on my Thanksgiving table! My mother in law makes this awesome zucchini bread. I LOVE IT! I could it and only it for days! I wish I had the recipe, but it’s long gone.. I love Blueberry Zucchini Bread, http://allrecipes.com/Recipe/Blueberry-Zucchini-Bread/Detail.aspx. I grow my own zucchini and I pick blueberries at my brothers’ house. The bread is delicious! I love zucchini fried with a lil bread crumb and seasoning. I love zucchini, crocked neck squash, and onions, some seasoning wrapped in foil and cooked on the barbeque. I would love to try this multi purpose, VR lens on a boat shooting wakeboarders!!! I swear I entered here, but I don’t see my comment anywhere! 🙁 Anyway, my favorite is Chocolate zucchini cake. So yummy! My favorite zucchini recipe is to slice the zucchini into spears and saute with bacon and onions. Delicious! oh yummy yummy yummy. my favorite zucchini receipe is something my mother-in-law makes called zucchini bake with sausage. I don’t have the receipe yet from her but someday she will give it out. 1. Bring vegetable or chicken stock to a boil in a medium stock pot, then reduce heat to a low simmer. 2. Melt butter in a large, heavy bottomed stock pot over medium heat. Stir in onions and cook for 2 minutes, or until softened. Add the rice and cook for another 2 minutes, stirring constantly, until lightly toasted. Gradually ladle in simmering vegetable stock, stirring continuously. Risotto will become “creamy” and slightly sticky, yet still firm in the center, or al dente. 3. When almost finished, stir in the zucchini, sun-dried tomatoes, and thyme, adding stock as needed and stirring continuously. Stir in basil and 3 tablespoons cheese just before serving. Divide risotto among 6 bowls, sprinkle with remaining cheese, and season with pepper to taste. I love zucchini on the grill or zucchini au gratin. yum. I make a zucchini bread every Sunday evening and eat it for breakfast all week long! I discovered chocolate zucchini cake about 10 years ago and it was the very first recipe I “perfected”…even if it is only perfect to me. I’ll search for the recipe tonight and post for all. But the olive oil, garlic and soy BBQ’d version from http://delishhh.com/ sounds amazing. I love Zucchini Bread, which I could easily make, but would love to have this lens, which would be awesome if I won! I love grilled zucchini and this Tamron lens. Oh goodness. I’m stuck in the fixed lens RUT! And have no dinero to upgrade… how I would LOVE this lens! P.S. No special zucchini recipe to share, I really dislike the stuff, other than the basic fried variety 😉 But you sure make it look good! My favorite zucchini recipe is a good ol zucchini bread recipe! I am a gardener and so I usually have lots of extra zucchini which I shred and freeze to use all year long just for this recipe!! my fave way to use zucchini is in a deep dark chocolate zucchini cake. you’d never know it was in there unless you search reeeally hard for the flecks. i make it in a bundt, skip the choc chip sprinkling and go straight for ganache instead. I love fried zucchini with horseradish dipping sauce! and I love this lens!!! We like this zucchini recipe : broiled zucchini with cheese. I adore zucchini bread from the abundance of summer zucchini from the garden! A little cinnamon, some chocolate chips, and I am in heaven! Zucchini on the grill, olive oil, salt & pepper, that’s it. Slightly charred, even better. Would love to win this lens. thanks for the chance! I just love to fix stir fried zucchini with fresh corn, mushrooms, and onions. I love fried zucchini with ranch dressing dip. I’ve been living in jerusalem the last year and have made this dish only once… the interesting thing is that zucchinis here are different than the US… they are smaller and slightly different in taste… Anyway tis is a very common local weeknight dish. I have a Nikon camera and would love to get a new lens!!! Thanks so much! The recipe looks great and so does the lens! My fav has to be zucchini bread but it runs a quickie behind grilled with olive oil. Going to blog about ‘cha now. Be back to post again. Don’t tweet but if I did I’d do that too. I passed along the news on my blog as well! I think my favorite zucchini recipe is so simple – grilled zucc with other veggies like summer squash, carrots, or peppers, brush with Queen Creek Lemon olive oil and sprinkle with Mrs. Dash Lemon Pepper. So healthy and fresh tasting! I would SO love the camera lens too! It’s gotta be sauteed zucchini and summer squash. YUM! My favorite zucchini dish is simple–drizzled with olive oil, salt, pepper, and grilled. My current favorite zucchini recipe is Balsamic Zucchini – it’s easy and elegant, and even got my vegetable-hating mom to like zucchini! Grilled with olive oil,sea salt and balsamic vinegar! Or roasted! Both very tasty. I LOVE shaving paper thins strips of raw zucchini and tossing it in a light lemony vinegarette and marinating for a bit to take away just a bit of the raw “bite” and serving…YUM! My favorite is grilled zucchini. I love it grilled with olive oil, kosher salt, and a little balsamic vinegar. I love grating zucchini and mixing it with marinara sauce. You can sneak in a lot of vegetables that way, and picky kids never know! I love to roast my zucchini in the oven with olive oil, salt and pepper. It’s my fave! My favorite zucchini prep: slicing them into long strips, rubbing them with olive oil, a sprinkling of salt and pepper, and then onto a hot grill. When they are done, I like to drizzle them with a balsamic reduction and freshly grated parmesan. Loved the photos demonstrating the zucchini recipe! My favorite use of zucchini in a meal is to use it for zucchini pasta — cut the zucchini using a spiral slicer and top it with the sauce of your choice — delicious and very low fat!! I like shredded zuschini and red onion rings tossed with a little olove oil, fresh cracked pepper and salt. I like steamed zucchini and melted cheese, as simple as that. 2 c. grated zucchini – add even more, the kids will never know it’s good for them! 1 hour for 2 loaves and about 18 minutes for 24 cupcakes. No recipe needed. I like my zucchini simple…just grilled with some salt and pepper. Zucchini lens… er, I mean, zucchini bread, and yeah, would love the lens too! My favorite zucchini dish is zucchini stir fry with other veggies! My favorite Zucchini dish is my mom’s zucchini bread. Grilled zucchini is my favorite! Fried zucchini will always be my favorite. Thank you for the giveaway! I like my zucchini in bread form to satisfy my sweet tooth. I also like it stewed in a nice tomato sauce to give my savory side a taste too. Thanks for the chance to give this lens to my husband. He has wanted a nice macro/zoom lens for many years. I made sauteed zucchini with butter or olive oil and salt and pepper a lot this summer for a quick side dish. I also like it as zucchini Parmesan instead of eggplant. Oh…I would love to have this lens! My favorite dish with zucchini is the zucchini bread that my mother-in-law makes! Yum! THANKS FOR THIS GREAT GIVEAWAY! awesome pictures! My favorite way to use zucchini is to grill it, brushing on italian dressing, or to use it like eggplant in zucchini parmesana. thanks again! Nice giveaway, thanks for sharing! I love these Zucchini Cherry Muffins with Pecan Streusel Topping and Open Face Roasted Vegetable Sandwiches with zucchini. I didn’t grow up eating zucchini so that may have contributed to me never really developing a taste for it, but as an adult I have cooked it twice and both times it was for Pasta Primavera which was quite tasty. I love zucchini raw in a vegetable salad–so good! favorite zucchini recipe? hands down ~ my friend Karen’s Chocolate Zcchini Cake with Chocolate Frosting. The most amazing cake, ever. I must get the recipe…. I like to pickle it. Oh, well I think the absolute best way to cook Zucchini is grill it and spritz it w/ spray butter and sprinkle w/ mozz. cheese and cracked pepper. YUM! I like my zucchini grilled just with salt and oil. My family loves zucchini cut into strips, brushed with a little olive oil, salt and pepper, and grilled. Yum! I’m not a big zucchini lover but I can remember being little and going to a restaurant with my dad and ordering it fried and served with ranch dressing for dipping. Not the healthiest but it sure it tasty. Love zucchini and I love this LENS !!! I have had zucchini muffins that were great but I have never personally purchased, or cooked, a zucchini in my life! Chocolate chip zucchini muffins! Yum! Pingback: Giveaway from SteamyKitchen | What's Anita's Deal? I love love love zuchinni it was the first veggie I liked at the age of 26. I had a slow start in life haha.I would use EVOO in a hot pan, put some diced garlic, get it sizzling. Then add zuchinni cut 1/4 inch or 1/8 inch. Add a little bit of kosher salt and pepper to taste. REally easy and simple. I’ve also used the same recipe to bake instead of stove top (just bake for 15 minutes, don’t let it brown or get soggy). I got my boyfriend at the time to eat it, he loved it so much he made it every meal. We paired it with fish, rice and called it a day! I would eat any zucchini dishes to just win this lens. Please pick me. Chocolate zucchini cake. So YUMMY! I came to love zucchini bread during my travels. Having said that, Tamron Macro Zoom Lens for Canon Digital SLR Camera will be awesome to win for my photography hobby during traveling! Zucchini bread!! Old school but so good! Man! could I use this … for my Nikon D90!! The best zucchini I’ve ever had was a lightly salted fried zucchini strip dish at a restaurant called The Caves in Fort Lauderdale. I love zucchini fried in butter. Oh how I would love to have that lens. Santa baby, pick me!! I would love to win this lens! My favorite is grilled zucchini. Just a bit of olive oil, fresh Italian herbs, sea salt and enjoy! I enjoy baking gluten-free zucchini carrot cake, with twice the amount of zucchinis! I would have to say I love it in any kind of curry! Yum. Makes me want to have some now. I make an italian style stew with zucchini in it. but i also like zucchini bread. i have also sauteed thin zucchini noodles in oil and garlic. YYYUMMMMY!!!!!!!!!!!! My favorite zucchini recipe is zucchini fries, the more virtuous cousin of french fries. They’re roasted in the oven with cumin, oregano, and seasoning salt–tasty AND healthy, what more can you ask for? i like zucchine skewers, its sauteed zucchine on a stick with other veggies, yum! Favorite would have to be zucchini bread. Thanks for the giveaway. My Favorite is breaded zucchini with pasta and tomato sauce! My favorite zucchini dish is pan fried zucchini with Parmesan cheese. It melts like butter in your mouth! Those look delicious! Zucchini is my favorite. I especially love Zucchini soup. Fried Zucchini!!!!!! and zucchini bread. YUM! I use zucchini a lot in soups and pasta…but I would say I love it the most simply grilled with a brush of olive oil and some salt and pepper! My favorite zucchini has and always will be deep fried in batter. We love zuccini in stir fry….it’s great in it, and lets us taste the zuccini! My favorite way to enjoy it is to sautee with mushrooms, onions, a little garlic, salt and pepper and just before serving, toss with a healthy sprinkling of fresh Parmesan cheese. YUM! I don’t have a recipe but I like to saute my zucchini then add a can or two of diced tomatoes and cook till hot. I serve this topped with grated parmesian cheese. I really like zucchini but my family is not a fan of it. But, everyone does like zucchini bread, so that would have to be my favorite recipe to use it in. I’d love to have that lens! Zucchini, tomatoes and basil lightly sauteed and served over angel hair pasta with parmesan cheese. Mmmm…. I like to cook up some hamburger with onions, add some zucchini and vine ripened tomatoes, toss some cheese on top- yum! I love a zucchini saute with fresh tomatoes and basil. Yum! But I want to try yours! I actually heard my stomach growl while looking at the pictures. Yum! I’m afraid that I’ve never been too adventurous with zucchini before. I’ve only eaten it in bread and fried form. But after looking at your recipe, I think I may need to expand my horizons. Thanks for the suggestion! Honestly I almost jumped thru my screen to eat those zucchini boats!!! YUM!!!! My favorite zucchini recipe that I make ONLY because I haven’t tried this recipe yet is zucchini bread using the zucchini’s from my sister in law Susans garden. And my other favorite zucchini dish is the fried zucchini from Carls jr. Mainly because it’s something my husband and I will share when we are out. Oh… I love zucchini and this looks soooo yummy! I love fried zucchini with horseradish dipping sauce. I am a birdwatcher and I would love this lens!! My favorite zucchini dish is to take a large zucchini, halve it lengthwise, scoop out the middle (not too much, gotta leave most of the squash intact for flavor). Then, make a pesto-sausage stuffing mixture using fresh basil, garlic and Jimmy Dean regular breakfast sausage. Spread the mixture over the zucchini halves and back at 375 for 30 or min. Sprinkle with fresh shredded parmesan with 10 or so minutes left. I love your recipe, thanks!! I love good old fashion zucchini bread and fried zucchini slices! My two favorite Zucchini dishes are fried zucchini and zucchini parmesan. Fried zucchini – super simple – dip in egg and then bread crumbs – fry and dip in ranch dressing! Yum! For several summers in a row we joined a group of hobby horse riders on a one week mule trip in Yosemite. The accomodations were great, and the food included breakfast, a packed sack lunch and dinner. We seemed to always go when the zucchini was plentiful as it was menued for every meal. So, it took a while for me to be fond of zucchini as an ingredient in a recipe again. I love this recipe from Chef Lou Aaron of Westside Catering in Boise: Grated Zucchini – Potato Pancake with Smoked Salmon and Apricot – Horseradish Sauce. my favorite is the stuffed zucchini my mom learned how to make in italy – yum! I make an orzo dish with zucchini that’s so good, and also I love thinly sliced zucchini on pizza. I’ve never met a zucchini dish I didn’t like. Thanks for the giveaway. One of my favorite (and most fattening) dishes to make when the summer harvest is plentiful is breaded deep-fried zucchini. I cut them in long flat strips, dip in egg wash, then in panko/parmesan/garlic breading and fry in olive oil. So light, crispy, and yummy! Zucchini fritter recipe from Ruhlman.com is hands down favorite! My favorite is chocolate zucchini bread! Delicious! This would be the best Christmas present ever! Please pick me. Grilled or roasted, depending on the season! I posted you on my blog! My mom’s zucchini casserole: bite-sized zucchini with a delicious creamy, savory sauce, topped with crunchy bread crumbs! So good and so comforting! My mom makes it every year without fail. I probably will for my family too someday! I love plain old roasted zucchini with some olive oil, salt, and pepper. Delish! Zucchini? What? This is so exciting to try! Thanks for the recipe! I want to try making an actually small zucchini boat to take a picture of… thanks for the inspiration! I love it just fried in apan with butter! my fave zucchini recipe is zucchini cut into quarters tossed with fresh chopped garlic, olive oil, balsamic vinegar and montreal seasonings, cooked on a charcoal grill. I have this weekly in the summer. Enter me, I’d love this lens. This recipe looks great! My favorite zucchini dish is fried zucchini slices. The absolute best part of the zucchini is the flower. I love those stuffed with cheese, battered, and fried. Holy YUM!!! Here’s my tweet about it! Hi! I’m not a zucchini fan, so I don’t have a favorite recipe. Sorry about that! I don’t like any squash at all, whatesoever. Not even pumpkin pie. I’m weird like that, I guess. I would LOVE to win that lens, though! I am going to have to make this recipe. I love Zucchini bread/cupcakes… sauteed, etc. yummers. I’m not a huge zucchini fan, but I do love zucchini bread! Deep fat fried Zucchini with spicy dipping sauce. i have really only had zucchini bread….never really tried anything else. but i love the bread! Oh woopsie… I was too busy thinking about how delicious the lens is that I forgot all about the zucchini. I am a tried and true zucchini bread eater. Love it! mmmmmm! I am drooling! Tamaron dessert… yes please! This lens would rock my socks! Ok, random.org- do your thing and pick me! Your recipe looks delicious. I planted zucchini in the garden this summer, but the bugs just ate it up.) I usually grill Zucchini. First I slice it, then place it in tin foil and smother it with italian dressing, salt, pepper and a dab of butter. Then grill it outside, at about 300 degrees for about 15 mins. It is so yummy. We also eat it fresh in our salads. One that includes it grated finely in some sort of yummy bread…with chocolate chips! Or, actually, just straight up grilled on the BBQ with a little EVOO and some “Mixed-Up Salt”! 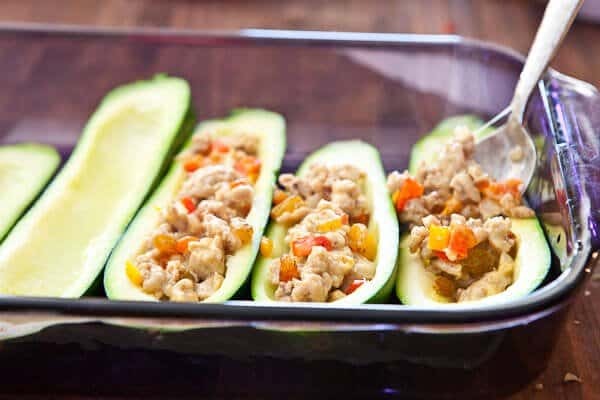 Those zucchini boats look amazing–I have to try them! Also, I’d LOVE to win the lens. Okay…I didn’t evern realize you used these for the lens giveaway but as far as me posted a link with my favorite zucchini recipe it would be yours. I took the leftovers home and ate them the next day (heated them up in my toaster overn) and they tasted just as good. Just looking at these pictures makes me hungry for them right now. Zucchini for breakfast – I say why not? Simple grilled zucchini coins. yum! Zucchini soup with gorganzola cheese! YUM. 🙂 Thanks for the giveaway and for the stuffed zuc recipe, I’ll be trying it for sure! My mom-in-law taught me how to make stuffed zucchini almost the same way as what you posted but it is stuffed with ground beef, onions and topped to grated cheese instead. It was so yummy. Hers though was made on the stove top though. Whoa!! This is an AMAZING lens!! I would love this!! I am just starting but really interested in photography, and when I cook something I’m proud of, I want to take a good picture of it!! I can SO do that with this lens! My fingers and toes are crossed!!! WOW, a lens like that would be so handy. I love Zucchini broiled with a little olive oil, salt, pepper and garlic powder. So simple and yet so wonderful and on the grill is even better. Favorite zucchini dish? Zucchini bread, of course! Love zucchini! It’s great grilled with olive oil, salt and pepper or roasted with squash and other veggies. Yum! Zucchini bread from Starbucks…it is yummy! zucchini bread. Old school, basic but oh so good! I love love love zucchini bread! oh how i would love this lens. it would be very happy in my little black bag. Actually, it’s the blossom. My Italian mother used to batter and fry the blossoms. Unbelievable. — Go to your favorite park, sit down and take pictures of your kids using your new lens while you snack on your zucchini. I promise, this will be the best zucchini you ever eat. I love little zucchine muffins with chocolate cips, cranberries and honey, Yum! My favorites are fried zucchini & zucchini bread! favorite zucchini dish might be ratatouille or stuffed greek boats from Moosewood (similar to this recipe) but then again, i’m a fan of zucchini! love the review of this lens and would love to have one! My aunt always made the best zucchini cake when I was little. I always think of that when I think of zucchini. However, I love eating it with other roasted vegetables. So yummy! When it comes to zucchini, I love it grilled. Just toss with a little EVOO, fresh pressed garlic, salt and pepper, and this girl is happy! my aunt use to make the greatest zuc bread – so moist! I love fried zucchini cakes! They’re better than fried green tomatoes. I don’t know that I have a favorite zucchini recipe. It’s not my recipe, but I love this zucchini parmesan I had one time from a place that doesn’t exist anymore. I know it’s super plain but I love sliced zucchini sauteed in butter! Korean Fried Zucchini… not the best photos. Fried Zucchini….I know, bad for you….still….smiles. I love to cook it on the grill!! I don’t have the recipe..but I love zucchini bread with cream cheese…yum! We love zucchini’s at our house, pretty much goes in everything I make from stuffed bell peppers to kabobs on the BBQ. But our favorite way to eat them is to grate them on a cheese grater into scrambled eggs every morning. So de-lish! Oh and I love chocolate Zucchini cake! i would love to win this lens. chocolate chip orange zucchini bread for sure! please, please, please let me win this lens!!! I love the old standby casserole with eggs and cheese and crackers. I substitute whole grain crackers for soda crackers. Yum. Yum Yum to both the zucchini and the lens. We always bake squash, zucchini, peppers, and broccoli tossed in olive oil with sea salt! Delish!!! Zucchini cream soon-without a doubt! I have never fixed any recipes with zuccini. Yours looks really good. I’ll have to try it. I like simple grilled zuccini. Great recipe, and great giveaway! I love to make Zucchini Nut Bread, but I’m also a fan of fried zucchini. Food is not easy to photograph and make look so scrumptious! Well done! I have never actually cooked zucchini. I do love bread. However, I WILL be going to the whole food co op tmw and buying the ingredients for THIS recipe!! My favorite zucchini recipe right now is just a simple saute of zucchini and summer squash, red onions and garlic. Mix with cottage cheese and (when in season) layer basil leaves in between and top with parmesan cheese. Bake until nice and bubbly. yummy! Ohhhh – I so need this! Count me in! Simple roasted zucchini on the bbq is my fav! Thanks for the chance to win! I love zucchini bread. Although your pics make me want a boat. I would love this lens, perfect for really getting into photography, thank you! I like it seasoned and sauted in butter. Wow, that recipe looks amazing. I need to try something like that! I usually just lightly sauteed slices of zucchini in a little bit of olive oil, salt and pepper. Time to try something new! Thanks for the chance at the lens! My favorite zucchini has to be classic zucchini bread…these look delish though!! I love a good zucchini bread recipe! My favorite is simple: saute some onions, garlic and zucchini in butter (can use olive oil, but not as tasty! ), to desired done-ness. Then top with grated parmesan and maybe some pepper (salt if you use olive oil). This heats up nicely the next day as well. Thanks! I love baked zucchini with a sprinkle of Parmesan cheese…mmmm! My friend has a lot of family from Korea and they don’t speak English- except they speak it through food. Her Grandmother would make these super thin zucchini pancakes and serve them one at a time and watch you eat them as if to make sure you understood exactly what she was saying. It was pure love! I don’t even know if a recipe exists for that. Spicy Shrimp and Zucchini Quesadillas, found in a Sunset magazine! grilled zucchini on the bbq is my favorite. i’ll take a picture if I win the lens! The recipe looks great as does the lens! It might be because I’m pregnant, but my FAVORITE dish in general right now is fried zucchini with ranch dressing. YUM! I must confess…the zucchini cakes over on PW’s page are by far my favorite things with zucchini. Zucchini bread…grilled zucchini on grill, covered with olive oil and sea salt…zucchini noodles. Currently, I have a really crappy kit lens – this lens would dramatically improve my pictures. I’d love to pair it with my Canon! I LOVE zucchini bread too! I really need to win the lens! It’s amazing!!!! I love zucchini in my brownies…sneak those veggies in! I love zucchini with some olive oil, salt & pepper and grilled. I came here to see about the lens but was totally sidetracked by the recipe! That looks like a great idea and I will try it soon. Thanks. Our go to zucchini recipe is for bread but I’ve been trying to get us to eat more of it as a vegetable. Stir fry seems to be a hit around here, mixing with whatever I happen to have on hand that day. Not really a recipe, but I like zucchini cut into pasta-like strands and mixed into cooked spaghetti. No favorite zucchini recipe here. I don’t mind zucchini in something but not a big zucchini eater here. Unfortunately, I don’t have a favorite. I’m not big on zucchini so I’ve never tried any recipes with it. i gotta jump on the zucchini bread bandwagon. I’m not the best cook but my favorite for zucchini is just to grill it or roast it with olive oil. Zucchini with Miso is the absolute nirvana for creating an amazing appetizer. My favorite zucchini is brushed with a little olive oil, sprinkled salt and pepper and grilled. Zucchini Bread is really good too. The photos look great. I would totally love to win a lens like that! Not a zucchini person but I can be if I win! I LOVE Zucchini bread…I don’t have a recipe but my neighbor makes it! I love Zucchini sticks from skinnytaste.com. Yum. This lens would be great when photographing my four grandsons. Talk about making it easier to get some great candid shots! My favorite zucchini recipe is toasted almonds with zucchini cut into matchstick pieces and sauteed in a little olive oil. YUM. I love fried zucchini. MmMm!! I have a thing for Zucchini Feta Fritters. Yum! i love zucchini bread! yummy. my nikon needs this lens, my fingers are crossed. thanks for the great giveaway! good old zucchini bread! I would love this lense! My mom used to make zucchini bread that was delicious! Death by chocolate chocolate chip zuchini bread! Ya, I nearly sacrifice my life each time I devour it! Love Tamron! This lens would definitely make life easier. I’d be willing to try this recipe. I wonder if that lense is available for an old Minolta DSLR (now Sony) camera? i love chocolate zucchini bread! And i really want to win this lens. My favorite recipe is Zucchini chocolate chip & pecan bread! I would LOVE to win that lens! I was pretty skeptical about a friends chocolate zucchini cake, but I was pleasantly surprised, I really liked it. Plus I love zucchini in stir fry! Just found this site and love it! I am gluten free so have tried the zuc in gf cookies and it tastes really good! I also love zucchini omelletes with bell pepper! I have a Canon and have had my eye on that lens…need to upgrade from my stock! (hehe….one word where food and photos intersect: stock!). Love it on the grill! Wrapped in foil, with a little butter, salt, and pepper! My favorite zucchini dish would be a chocolate zucchini cake recipe I was given many, many years ago. It made the cake so moist! Zucchini bread or Fried Zucchini are the best! I like this chicken, zucchini, squash soup my mom makes. So simple yet sooooo good. I love All Zucchini dishes but most of all I love fried zucchini it is so delicious???? In a salad – Delcicious!! My mom has a chocolate zucchini cake recipe that always fooled me as a kid! I never knew I was eating something so good for me! Please enter me in the contest for the lens… If I win, I will make that cake and send ya pics! Grilled with a little olive oil and salt and pepper! simple and yummy! I love to saute onion and garlic then slice and add the zucchini. Yummy, yummy, yum! Oh, and zucchini bread, cookies, and cake. Just slice it up, bread adn fry it for me! zucchini bread with butter. yum! I love pickled zucchini…any kind! mmmm, thick-cut, grilled straight up with a spicy aoli and salt. i could mow down a bushel! I like it pan seared with peppers and pasta! my favorite zucchini dish is zucchini bread….yummo!! and I would love love love to win this lens!! My favorite zuchini recipe is Qusa.. A middle eastern dish.. Stuffed with rice, tomatoes and ground lamb.. Yum! This looks like a neat recipe item for my kids. They love veggies (I am sooo lucky) and trying new things! Don’t have a specific zucchini dish… Love to use it in spaghetti or in chicken dishes though! Thanks for sharing! My favorite recipe is zucchini gratin prepared by Ina Garten. THis is a delightful recipe and can be served as a main course with your favorite salad. Follow this link for the recipe. I’d love to have that lens Jaden! I have a Canon Rebel and it would make a wonderful start for my camera equipment collection. Thanks for all your great food and ideas Jaden! My favorite way to eat zucchini is grilled with a little lemon pepper…yummy! My absoltu favorites zucchini dish is “Zucchini spread” and the recept find on my blog http://kingablogger.blogspot.com/2010/04/cuketova-pomazanka.html. Recept is in slovak language, but google translator help whit this problem :). I have several neighbors give me zucchini because they were given it etc & don’t use it etc. I love to make zucchini bread & the other one I use is dice it up, throw it in a casserole dish with stuffing (stove top or bagged), and creamed soups, spices & bake it in the oven. Its the first thing ate at the table. good old fashion zucchini bread. It’s just such a comfort food, especially this time of year. Warm and yummy! My favorite zucchini recipe…this may not be very original, but Blueberry Zucchini Bread: http://www.viciousdishes.com/2009/08/blueberry-zucchini-bread.html Yum! After having zucchini prepared every way imaginable this last summer because of the bounty of our garden, I learned how to can zucchini relish. Nothing better than delicious zucchini relish on burgers, mixed in salads, etc… Love the versatility of this Tamron lens. Hope to win! In the summer, I could live on grilled zucchini an zucchini fries. I love it grilled! Will be trying this recipe though! When I was a kid my mom used to shred zucchini and put it in chocolate sheet cake. It made for a super moist cake. Slice them, then cook them, in a little olive oil, with sliced onions. Add DeiFratelli Seasoned Diced tomatoes, simmer for 10 minutes, and serve over penne pasta. Yum! Zucchini Apple pie is our favorite…tastes just like Apple Pie…can fool my friends! One of my favorite things to do with zucchini is really, really simple. I cut it up, along with whatever other vegetables I feel like eating (onions, mushrooms, yellow squash, whatever you like! ), and saute it in a bit of olive oil and some garlic. It makes a great side dish! You can also add a little sea salt and pepper while it’s cooking. So good. Yum! I love zucchini fried simply with breadcrumbs and served for breakfast with eggs, fresh herbs, and fresh garden tomatoes. It may not sound thrilling but it always makes me so happy. I love zucchini bread and would love that lens! 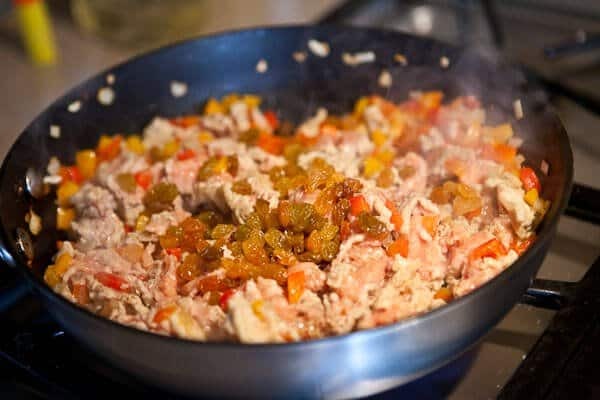 Simply chopped up, sauteed with some olive oil and garlic, and then thrown in with some pasta and tomato sauce – maybe some sausage thrown in there as well! I just started making zucchini dishes. I love plain and simple zucchini bread and I love it even more that my kids love it since I can never get them to eat zucchini! My favorite zucchini dish is a salad of thinly shaved zucchini and arugula with freshly shaved parmesan/reggiano with an olive oil and lemon dressing – so fresh and tasty! I prefer my zucchini uncooked. And I would love to try this lens! Mmmmm, I love zucchini in hibachi chicken. So delicious! That zucchini dish looks delicious!!! Must try. My favorite zucchini recipe is bread but I also like some pan fried zucchini too! I love zucchini muffins. And I’d love to win this lens. Since I have such a sweet tooth, I’ll have to go with zucchini bread. Although, I really do love steamed zucchini with parmesan cheese on top, too. Favorite would have to be zucchini bread my mom used to make. Yum!! I actually love making stuffed zucchini myself! My dad always made it when I was a kid, and I have always adored it. He did a rice/beef/onions mixture inside. I usually add lots of garlic and tomatoes as well when I make it now. The photos you’ve taken of this recipe are just GORGEOUS. Would love to win that lens! also, what a great giveaway!!! You’re awesome! I love chocolate zucchini bread. Favorite for sure. Deep fried zucchini is pretty good. I’ve never made it, but I had it at a restaurant. My friend makes the best chocolate zucchini muffins. They are so moist. Delicious! I love sauteed zucchini. A little kosher salt, pepper, olive oil and onions. Sometimes I will add some yellow squash. Zucchini bread with chocolate chips! I love my zucchini simple – stir fried with a little butter … salt and pepper. Yum! I like to add zucchini to my veggie soup! but they’re nothing as elaborate and scrumptious as yours. Jaden, I will definitely make these! I am all about zucchini bread. Yay zucchini!!! Wow, those are amazing zucchini pictures. I could use a lens that makes my mouth water! diced zuchinni, corn and grated cheddar cheese in a skillet over medium-high heat until the cheese melts. season with salt and pepper and serve with steamed rice. and i NEED that lens! have a great day! I’m ashamed to say I haven’t had any zucchini since my husband and I moved in together. He says he doesn’t care for it. Your recipe sure makes it sound great, though. It might even be able to convince him to admit that zucchini can be good! Thanks for the recipe! I so wish I liked zucchini… I keep trying it different ways, but no luck yet. I don’t think zucchini bread counts:)! I would eat zucchini everyday to win this lens! I hate to say it, but I don’t like zucchini. Just tonight we had a great stir-fry, loaded with zucchini. Mmm, Mmm, Good! I’m thinking with a tutorial like yours, middle east stuffed zucchini boats just might become a mainstay around here. Just tonight we had a great stir-fry loaded with zucchini. Mmm Mmm Good! With a lens like this, I’d even share photos of my prep ~ but I’d say nothing beats your tutorial. Great job! We’re going to be trying stuffed zucchini boats, soon. My kids and I love zucchini brownies… the best!! I like to dip sliced zucchini in egg then panko crumbs. Then bake it. It’s delicious. I also enjoy zucchini cake, I mean bread. I love Zucchini bread. I also like breaded, fried zucchini. Would LOVE a new lense to go with my new camera! If only I would be lucky enough. . .
Those pictures are awesome! Fingers crossed. I love zucchini bread (for a baking favorite) and minestrone (for a cooking favorite). Yum! I’m a huge stuffed zucchini fan – my favorite involves bacon, goat cheese, garlic and onion. I’ve got to try yours now too! My favorite zucchini recipe is to make them into little bite-sized pancakes (like potato pancakes), sautee then top them w/ smoked salmon & creme fraiche, or tapenade, or goat cheese or a really nice zoom lens ! My favorite zucchini recipe is my mom’s old fashioned zucchini bread… I can’t put that stuff down! I love zucchini sandwiches with cream cheese, wheat bread, tomato and bacon! Delicious. i love zucchini sauteed with onions and garlic and served over rosemary steel cut oats with a fried egg. i eat it almost every morning for breakfast! Ricotta stuffed zucchini flowers, deep fried, of course! I love sauteed zucchini with squash and mushrooms! I would love to try that lens! I would love to capture my four daughter with it! Recipe looks awesome, can’t wait to try it! I have a zucchini lemon bread recipe that has been a long time favorite. My mom always used to make a zucchini dish when I was a kid that had sliced sauteed zucchinis and onions in it. I can’t remember what else she put in it, but it was so good. She also made great zucchini bread, too. Yum. And I would love to win the lens! I wish I would have had this about three weeks ago, when the zucchini is coming out of everyone’s ears! I would say zucchini bread is my favorite recipe, but I’m so very tired of it (did I just say that?). Thank you for this recipe and giveaway! I love zucchini cakes. With a little bit of ranch dressing. Yummy! I actually hate Zucchini. Sorry! 😉 But I am diggin’ that lens! I would love it for all my kids’ and their variety of activities. Chocolate Zucchini Cake is my favorite. Yum! That lens would take great pictures of my kids and grandbabies. I love zucchini tossed into about any stir fry, or grilled along with chicken… but, my favorite is my grandma’s zucchini bread! I like zucchini bread and stuffed zucchini boats, but I did not grow up as a vegetable lover, so have had to acquire the taste. However, Annie’s Eats featured one zucchini recipe that left even this vegetable-hater wanting MORE!!!!!! Seriously, it is amazingly simple and delicious and lets the vegetable goodness shine. I love my 50mm fixed lens, but this Tamron would open up a whole new world for me!!!! Zucchini pancakes with lots of hot peppers in it! Yummy, I guess I found the answer for dinner tonight! My mom makes a zucchini casserole that has to be my favorite. You’re pictures look so yummy! I would love to have the lens and your talent! Ooh, toss up between zucchini bread and zucchini chocolate cake. Although these look fantastic!! Zucchini on lavosh. MMMmmmmm…..all that melted havarti, vegetables, YUM! Would love a chance to win this lens! I would love this new lens. I have a great camera and I am taking a photography class to learn how to use it! I would love a new lens to make my pictures oh so much sweeter! Thank you! I love anything with zucchini but zucchini chocolate cake would have to be my favorite! YUM! All I want for Christmas is a new camera lens, a new camera lens, see a new camera lens, and then I could takes pictures of my six year old daughter wanting her two front teeth! My favorite zucchini is grilled with a little olive oil, salt and peeper! Zucchini bread… or fried zucchini…. or lasagna, it’s all good. Great photos, I bet this lens is great! I don’t really have a ton of good zucchini recipes, but this one looks good! Wow, I’d love to win that lens! I’ve never had a zucchini dish before, but your recipe looks pretty delicious, I have to admit. As to the lens I’m drooling over that baby! I’ve been saving for a long time to upgrade my camera and get a DSLR (which I will be buying during Black Friday sales) and I would LOVE to get this lens to go with it! My favorite zucchini dish is a salad made with paper-thin slices of raw zucchini, parsley and shaved Parmesan tossed with a lemon vinaigrette. Easy and delicious! And, if I win the lens, I will send you a beautiful picture of this salad! When I make Zucchini I chop it up with some yellow squash and onion. I put all of it in foil and pour either a Greek dressing or Ceasar dressing over it and put it out on the grill (works in the oven too!) until the veggies are good and soft. So yummy! Sometimes I sprinkle with extra parmesan when they veggies are good and hot! I love zucchini raw with salt, pepper and spray butter. Yum. I love to eat zucchinni raw with a wonderful dip! This lens is wonderful! Would be perfect to take pictures for the holidays. Giada’s Baked Penne with Roasted Vegetables is the way I prepare zucchini so the whole family will eat it. Love it. And I LOVE that lens. It would go great with my new camera. Budget won’t allow me to purchase anything else right now. This would be wonderful! Thanks. This lens looks amazing…would love it for my Nikon! This zucchini recipe excites me because it is gluten free…which is what I have been forced to become since April! I will surely make it! My most recent zucchini recipe was a gluten free Zucchini Bread. Shred the zucchini and chop the walnuts in a food processor and set them aside. Use a mixer to beat the eggs and add the sugar, oil and vanilla. Add the baking soda, cinnamon, salt and baking powder. Slowly pour in the flour and xanthan gum until well mixed. By hand, mix in the zucchini and walnuts. Pour in greased & floured loaf pan and bake at 350F degrees for 75 minutes. Let cool. Thanks for offering this cool giveaway! I love chocolate zuchinni bread, yum! That lens looks fabulous! I’ve got my fingers crossed!! Heat oven to 400ºF. Coat a 3-qt round baking dish with nonstick spray. Heat oil in a large nonstick skillet over medium-high heat. Add onion and saute 5 minutes. Add zucchini and cumin, and saute 5 minutes or until zucchini is crisp-tender. Stir in tomatoes, beans, corn and enchilada sauce; bring to a simmer. Remove from heat and stir in cilantro. Put 1 tortilla in baking dish. Top with 11⁄2 cups zucchini mixture; sprinkle with 1⁄4 cup cheese. Repeat layers 4 times. Cover with foil and bake 20 to 25 minutes until bubbly around edges and cheese is melted. Cool 5 minutes. Cut into wedges and serve with sour cream, if desired. YUM –Enjoy. Keep your great recipes coming. And PLEASE I have no fancy lenses for my Canon yet…I would use this everyday!!! I love zucchini from Japanese chop houses! I little olive oil and soy sauce, yum! The zucchini sounds delicious and so does this lens!!! 🙂 It would be so amazing to win it!! My favorite zucchini dish is a zucchini frittata from the Deborah Madison Vegetarian Cooking for Everyone cookbook. Delicious! I’d love to win this great lens to add it to my camera bag. I love my Zucchini Beef Casserole! Serbian stuffed zucchini takes me home every time I make them! Zucchini fries! Definitely. Or wait, maybe zucchini pizza. It’s tied. Both are delicious!! my favorite zucchini dish is actually really boring– grilled with olive oil and fresh ground black pepper (I don’t think a recipe is necessary for that, haha). It’s just so delicious that way; I always have trouble not eating it all before the rest of the meal is done grilling! Would love to try this lens! My favorite zucchini recipe is zucchini pesto! So delicious. And here is my link. Looks like an awesome lens! Zucchini cake… similar to carrot cake. I love poblanos stuffed with zucchini (and other great veggies). i love zucchini grilled simply, or raw and marinated with tomatoes and feta, or in zucchini bread (preferably with chocolate, of course). i really, really love the blossoms, stuffed with ricotta and fried. such a treat. 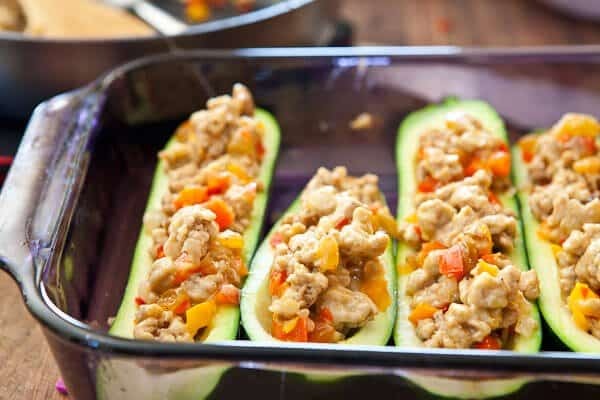 I love love stuffing vegetables but have never used a meat, only other veges or seafood, will have to try this , zuchinni is a family favorite so I always have some at hand. As for the lens I’d love to upgrade, I’ve owned tameron slr lenses in the past and would love to have a digital. Bring a large pot of water to a boil and salt it. Put two tablespoons of the oil in a large skillet over medium-high heat. When hot, add the corn and cook, stirring only occasionally, until the corn is dry and really beginning to brown, about 5 minutes. Add the zucchini and some salt and pepper. Cook, stirring occasionally, until the zucchini begins to brown. Add the onion and the garlic. Cook, stirring occasionally, until the onion softens, about five minutes. Add the tarragon and cook for 30 seconds, then add the tomatoes and continue cooking while you cook the pasta. Cook the pasta in the boiling water until tender. If the sauce dries out, add some of the pasta-cooking water, about ¼ cup at a time, to thin it somewhat but not make it a soup. When the pasta is done, drain it and toss with the sauce and the butter or remaining oil. Taste and adjust the seasoning. Serves four. WOULD LOVE TO WIN THE LENS!!!! I love to saute it with squash and a little parmesan cheese… and I would love to win this for my hubs because it is all he talks about!!! We grow a ton of zucchini and raise pigs and sheep as well. My husband thinks zucchini boat #1 tastes like pizza! We often will grill them for a smokier flavor. Zucchini Boat 2) Ground Lamb with garlic, rosemary and oregano and lemon zest topped with feta and pinenuts. Served with tzatziki and bread or naaan. My favorite zucchini recipe lately is Heidi from 101Cookbook’s Summer Squash gratin…. soooo delicious. Even though I use way less butter than the original recipe calls for, it still tastes so delectable. I would LOVE to win this lens. I could definetly put it to good use taking pictures of my daughter!!!!!!!!!!!!!!!!!!!!! Favorite zucchini recipe is a summer vegetable grautin. Layers of zucchini, summer squash, tomatoes, onions and garlic, drizzled with olive oil and sprinkled with parmesan. The trick is salting the veggies for 30 minutes before layering the slices, it draws out the excess moisture and keeps the dish from being soggy! parmesean cheese. Bake in a 375 degree oven for about ten minutes. Okay, that recipe looks amazing, the photos are amazing, I love everything about this post! And the giveaway is just icing on the zucchini! I pretty much like any recipe involving zucchini, but I think veggie kebabs on the grill are probably my favorite way to eat them. I like zucchini fritta, quick and easy and cheap! P.S. I wasn’t going to enter since I don’t have a DSLR, but my other half just happened to walk by and say, “Hey, I was thinking about getting that lens.” I’d much rather win one than buy one, lol. Zucchini pumpkin bread! So yummy! Love zucchini cranberry bread. Especially around the holidays. I’m a good ole’ girl from Texas where we like to fry everything so I’m going with fried zucchini—dipped in homemade ranch of course! oh my goooodness, that lens is amazing and your pictures are jaw dropping. Does zucchini bread count? I love it! I love all things zucchini but stuffed zucchini seems like such a big effort. I usually just slice it thin and grill with olive oil and salt. Simple and delicious. Most certainly zucc bread with juicy blueberries and a crumb topping. To die for! My favorite is zucchini bread! Sorry I don’t have a recipe to share! breaded zuccini is the best, will send a picture when I win! I love zuccini bread! I also love to puree zuccini and slip it in several recipes for my picky kids. I would love to win this camera lens for my sister, who just got a nice canon rebel and who also LOVES to take pictures of her kids. My favorite would have to be fried zucchini flowers stuffed with cheese, it’s delicious. I just like to grill or stir fry zucchini with a little bit of olive oil, garlic salt, and pepper. My sister and I would request zucchini boats for our special birthday meal when we were little. Ground beef, the zucchini seeds, salt, pepper. Lay them right next to each other in a pan and cover with cheese. Yum. Mmmmm! …one of my favorite things to do with zucchini came from a book I bought this year at Sur La Table! It’s awesome. The recipe is for a simple carrot/zucchini bread, but seriously,…it’s the best. YUM! >> Also, i’d reeeeally love this lens! Woo! My favorite way to cook zuchini is shredded and then sauteed. I have always loved zucchini bread…mmm! Also, a Korean zucchini and shrimp paste soup. Yummers! These little zucchini boats are just adorable! I like zuchinni simply stir fried with tomatoes and onion, over rice. I usually love zucchini sliced and stir fried with olive oil and italian seasoning but this summer I subbed it for pasta by using a vegetable peeler to make thin ribbons of zucchini and tossed it with olive oil, cherry tomatoes, onions, garlic & seasoning – Yum! I’m not usually big on zucchini, but I love making zucchinni fritters! Like potato pancakes, but with zucchini. Grate zucchini, onion, and garlic; then mix with an egg, a little flour, salt, pepper, and LOTS of parmesan cheese. Serve with sour cream and smoked salmon. Delicious, and also low carb. This does look like a good recipe. Thanks for the information. We usually just saute zucchini and yellow squash with a bit of olive oil and Mrs. Dash seasoning…mmmm. I just found a zucchini quiche recipe that I want to try though. Hope I win the lens!!!! Its my birthday! And these look delicious! Zucchini bread and fried zucchini are my favorite!!!! I make zucchini muffins! I use the same recipe for carrot, pumpkin and zucchini muffins. They are all delicious, but the pumpkin is my favorite. Jaden, your 18-hour bread is still my fav recipe in the WORLD! Not to offend the zucchini, I do like them too, especially fried and layered with polenta and cheese! And yes, I would love the lense just like the rest of my fellow desireres above. Would love to win! I love zucchini bread. I love zucchini bread and I used to make a dish that was layered (sliced zucchini, stewed or diced tomatoes and cheese, repeat) covered and baked in the oven until zucchini was cooked. Zucchini carbonara ala Jamie Oliver. Also love Marcella Hazen’s shredded zucchini and tomato pasta. Simple stir fried zucchini. Olive oils, seasoned salt and topped with parmesean. Great for a quick side dish. My favorite zucchini recipe is zhcchini and chicken stir fry. Just a simple chinese homemake dish I like to serve once in a while. I love blueberry zucchini bread! 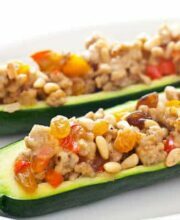 I like my zucchini tossed in a stirfry, but I would love to try the zucchini boats! I am a sucker for good ‘ole zucchini bread! I love and so does my daughter! We love sauteed zucchini in spaghetti sauce. It’s so good over pasta instead of meat. If I actually liked Zucchini I would post some yummy recipe but I would still love the chance for this amazing giveaway! Zucchini Bread! It’s a classic! favorite way to eat zucchini is in bread! yums. I love zucchini parmesan… like eggplant parm but with zucchini instead! I’m seriously coveting that lens now. mmm! beautiful photos! my favorite zucchini recipes are my mom’s zucchini bread (moist & green-specked) and deep fried zucchini blossoms stuffed with fontina cheese. delicious! Heat oven to 400 degrees. Grease 8 inch square pan. Cook sausage to brown, cook zucchini for just a few minutes, drain. Stir in salt and cheese. Spread in pan. Stir remaining ingredients until blended. Pour into pan. Bake about 25 minutes or until knife inserted in center comes out clean. Perfect side dish for brunch or an easy app! I love zucchini in any form of pasta. Preferably with a very fattening, cream sauce. Fried Zuchinni- dipped in egg, rolled in flour, fried up in oil. Definitely not the most healthy way to eat your veggies… but still eating them right? I love making zucchini bread! I don’t know that it counts as a “dish” but my favorite way to have zucchini is grilled with some butter, salt, pepper and garlic. Yummy! I’m not a big fan of zucchini but I do like Zucchini nut bread or muffins. Crossing fingers and toes for this. I’d love a new lens! I actually can’t stand zucchini, but my husband loves zucchini cake so I make it for him. My favorite stuffed squash recipe includes a stuffing made with polenta and sausage. You can use it in zucchini (of course) or any other squash you might have around – acorn works wonderfully! I am also a huge fan of squash soups. Honestly i love to eat zucini just plain with a little butter. And i love this lens. I love grilled zucchini with olive oil, salt and pepper. Simple but so yummy! I would love this lens! I’m a fan of classic steamed zucchini with butter, salt and pepper! I LOVE the ricotta and zucchini galette that Deb from SmittenKitchen blogged a few months ago. It is fabulous. I hesitate between zucchini soup and zucchini bread both equally delicious. Thanks for the chance to win the Tamron lens. zucchini is one of my favorite vegetables! Cooked layered with tomatoes and covered in mozarella with a little oregano and salt on top is my absolute favorite and very easy. Not to mention how much I would love that tamron lens! I actually don’t have a favorite zucchini recipe! I don’t like the flavor of zucchini (the zuchini bread is ok) can I still enter the giveaway? Fried zucchini, but I add grated Parmesan to my flour…it is sooooo yummy. I love raw zucchini in salads. Oh, and please pick me I desperately need this. I love chocolate zucchini cupcakes! I pretty much love all things zucchini, but I have to admit my favorite is still good ol’ fried zucchini. If it’s battered just right, it’s really pretty much heaven. Fried heaven. wow…I’ve had this lens bookmarked for the last 9 months. Just can’t justify purchasing it…to many needs and this is definately a want. 9×12 dish. Cut enough zucchini into disks to cover bottom. Add a little sea salt. Next layer is sliced green pepper. Next add some sliced onion. Another layer of sea salt and a little garlic salt. Finally, slice a lot of tomatoes over the top, cover with sharp cheddar cheese and bake for 25-30 minutes. It is so fabulous. I have lens envy and now I’m hungry too. I will have to try that recipe this weekend. I love Zucchini Bread of any kind. I worked at Starbucks for awhile and could eat that Zucchini Bread everyday of my life, unfortunately I gained a couple of pounds. I don’t get to eat zucchini because I’m allergic to it, but my husband loves anything with zucchini! When my garden was overgrowing zucchini this summer, I posted a recipe for a Lebanese stuffed version with parsley and mint. The zucchini are cored and left whole, stuffed and simmered in a tomato broth. It’s a more traditional version. My favorite is chicken and zucchini. Right now, my favorite zucchini recipe is a zucchini salad where the zucchini is cut into pasta-like ribbons. my favorite is the tried and true zucchini bread- but my Mom’s is the best!! and try adding in blueberries to the bread- awesome! I love zucchini bread. So yummy! Oohh a lens just for the exact camera I have!! My favorite zucchini dish is simply just roast zucchini with some spices. But I’ll definitely have to give these zucchini boats a ride, although meatless for me! Fried zucchini and zucchini bread are the best! I don’t have a good recipe but I love fried zucchini sticks. Thanks for the lens giveaway! My favorite is zucchini stir fry. But really, what isn’t delicious when fried??? I am obsessed with zucchini boats. I love trying different variations of them. I’m going to try yours asap! I like fried zucchini. Simple. Easy. Tasty. I like my zuccinni baked with butter, salt and pepper. Simple and delicious. I love zucchini marinated in olive oil, lemon juice, garlic, salt and pepper cooked on the grill. Oh good another great zucchini recipe, and a different one at that! I love using it year round. The lens looks like it works perfect! I love it grilled with vegetable seasoning, salt, and olive oil… But th only way I can get my hubby to touch the stuff is in bread form, lol. Your recipe looks delicious I will definitely have to try it! Try my favorite stuffed zucchini recipe you will fall in love. The link is below ! I like Zucchinni stir-fryed with other veggies like Mushrooms, Onions, and Green Peppers. Then add a little mozzarella cheese on top. my favorite zucchini recipe is a stuffed zucchini that you will with ground hamburger, a LOT of yummy oregano, diced up mushrooms, onions, garlic, the zucchini that you hallowed out (chopped up), and tomato with salt and pepper to taste. You fill the unbaked zucchini boats with the meat mixture, sprinkle cheese on top and bake at 400 for about 30 minutes. SO YUMMY! HOPE I WIN! I would so LOVE to win this lens. My favorite zucchini recipe is chocolate zucchini muffins…yummy. I love the zucchini feta casserole recipe from the Moosewood cookbook – sounds delicious right now! I love to make fritters with my zucchini…They have become a huge hit in our house! i love a good ratatouille! It’s simple, but I just crave fried zucchini. I’m almost ashamed to admit that my favorite zucchini recipe is a copycat of Benihana. 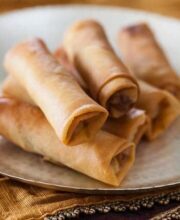 :p It’s simple and delicious when dipped in their ginger sauce, but much cheaper and healthier to make it at home. For me it is a toss up between my favorite zucchini bread recipe and just pan frying it with some sliced up onions and a little oil. I love zucchini in fritters, bread, and ratatouille; stuffed, breaded, grilled or fried. But my favorite way to eat them is the way my mom prepares them – sliced in coins, dipped in flour and egg, fried and served with a soy/rice vinegar dipping sauce and rice. So yummy! I love my grandma’s zucchini bread made with fresh zucchini from her garden. my fav is zucchini bread.. and i would love to win this!! Zucchini bread with chocolate chips of course! This recipe looks so yummy… but my favorite zucchini recipe was stuffed baby zucchini I learned to make at a cooking class in Florence, Italy. Just a little cheese, prosciutto, tomatoes– an Italian twist on this recipe! My favorite zucchini recipe is an Italian vegetable dish with yellow squash, zucchini and tomatoes that are cooked together with salt, pepper and a little bit of olive oil. It’s great! Love love love zucchini any way you slice or dice it but Zucchinit Bread has to be my favorite! My favorite zucchini dish is when they are added to asian stir fry! hibachi chicken plus mushrooms plus zucchini = awesome! Would love to have this lens! Seriously! I can’t say no to chocolate chip zucchini bread! It’s especially drool-worthy when it’s fresh out of the oven…yum. What a coincidence! My favorite zucchini recipe is an italian zucchini boat and I just picked up some zucchini yesterday to make some this weekend! I love it simply sautéed with onions & garlic. My fav zucchini recipe is stuffed zucchini boats; similar idea, just different ingredients. Zucchini, sausage, breadcrumbs, parmesan, garlic, paprika. My most favortie way to fix zucchini is to brush with olive oil, sprinkle with lemon juice, and grill! Yumm! Zucchini bread with white raisins and pecans. Yummy! I love Chocolate Zucchini bread or really just adding it to any stir fry! Hands down it’s my favorite veggie! Pick me for the lens!!! pameladana at gmail dot com! My favorite is Zucchini bread with dark chocolate chips! Simple simple. Zucchini sauted in a bit of olive oil, onion and garlic. Then top off with marinated artichoke hearts & a bit of the marinade. Ladle the whole thing on a plate of linguine, sprinkle some red pepper flakes & shaved parm. Side of garlic bread & Caesar salad. Heaven! Love me some fried zucchini. It is pretty easy to make and delicious! zucchini bread, but zucchini fries are a close second. I am all about Zucchini Fries! Breaded in Panko and Parmesan served with a side of marinara. My favorite zucchini dish…is in a Japanese stir fry, but zucchini bread is pretty delicious too!! I love zucchini grilled, sprinkled with sea salt and Parmesan cheese. Yum! I would love this lens! Cut zucchini into thin disks. In a single layer, fry in olive oil (with no breading) until brown. Remove to plate. Add salt and pepper, italian seasoning, and shredded Parmesan cheese. Continue to fry zucchini in single layer batches and layer on same plate and seasoning. Cook any kind of pasta and toss everything together. Super simple, but absolutely delicious. I have been eyeballing this lens for a while and working out how long it would take me to save for it. Hope I win! I batter it with cornmeal and fry it golden brown…. I was just recently given a recipe for blueberry zucchini bread that was delightful. I like my zucchini sliced and stir fried with just a sprinkle of coarse salt, or grated and baked into zucchini bread. Great photos! I hope I can win this lens!!! I love grilled zucchini with salt, pepper, and lemon juice. I love sauteeing onions and garlic, then mushrooms, then zucchini and maybe summer squash. Add salt, pepper, garlic and onion powders. Yum! I like zucchini simply sliced and sauteed in olive oil with garlic and salt. I would also love this lens! Thanks for the opportunity. I love your blog, and I love lenses! My favorite zucchini recipe is definitely zucchini bread! I love how it makes my house smell wonderful and homey. Just like when I was growing up and my mom made it for our family! I love zucchini muffins. YUM! My favorite is definitely zucchini fritters! zucchini bread is my all time favorite zucchini recipe. it doesn’t taste healthy! 🙂 thanks for the opportunity! Plain ol’ fried zucchini or zucchini bread, actually that’s my favorite! Zucchini bread with chocolate chips. Yum. My favorite zucchini dish is from Maggiano’s Little Italy. It is their Crispy Zucchini Fritte. I LOVE IT, and I wish I could make it the way they do. Panko bread crumbs make the difference! It is just awesome!!! Zucchini dish!? I am 22, I have never cooked with zucchini… Um. BUT… I hear that deep fried zucchini is delicious… But I am scared to try it! Hahah. I am not sure how I feel about zucchini… Honestly… I think I don’t really like the name of it… oops. I love taking pictures of food, and nature the best!! My favorite zucchini dish is tempura style…yummy! Ratatioulle…or however you spell it. Also goes well with almost every muffin reciepe, brownie reciepe, cake…. I love fried zuchini in a tempura batter! Dip it in ranch dip w/a small bit of horseradish…. Yummy! My girlfriend’s zucchini bread 🙂 Available at our site. I have a sweet tooth – so definitely Zucchini bread! i love putting zucchini in a basic marinara sauce to give it more green! My eight ball squash recipe is reall delicious and easy to make. This is a recipe that I got from my Aunt, that I would have never even thought of. Every time it is made, no matter how many are made, none get thrown away. The kids reheat them. They’re just that delicious. You can make them with or without the Jalapenos. Personally, I think that makes it so much better. Just grate up a bunch of zucchini. It doesn’t matter if it’s green or yellow. (use the larger hole on your grater – so that it doesn’t get to watery). Dice up a Vidalia onion and a green bell pepper. These two things are to taste. I find that for maybe three medium sized zucchinis that one and half of each does the trick. I usually do two batches, one with Jalapenos and one without. A couple to several Jalapenos diced up small can be added to one batch (depending on the heat of the peppers). They’ll sweeten up and lose a lot of their heat during the cooking. Salt and pepper to taste, one egg in each bowl and mix in some flour. This is going to seem kind of runny. You’re basically making something along the lines of a potato cake, but you don’t want it as firm as that, it’s going to be kind of wet, especially since you grated the zucchini on the large hole. Fry patties in hot oil until browned nicely on each side, and let drain on paper towel. Keep warm in the oven while cooking the rest. I usually have two pans going when I do this. This is one of the most delicious dishes I’ve ever had and I’m not a big zucchini recipe person, other than the occasional zucchini bread. saute some cumin seeds in olive oil. then add zucchini slices, salt and pepper, cayennes pepper, and saute til done! Korean style battered and fried zucchini dipped in soy sauce! yum! I guess I’m boring, but I do love zucchini bread!!! I like anything someelse makes! I like zucchini pasta carbonara. I love my zucchini brushed with a bit of garlic oil and grilled. ove zuchinni bread but you cant beat plain sauted zuchinni and scrambled eggs. its a favorite here. hope i win!!! I like zuchinni dipped in beaten eggs then pan fried on both sides until golden. Eat with soy sauce with gochukaru = yum! Lightly grilled with a touch of salt & pepper. I make this zucchini kugel…it’s amazing, really. Chocolate zucchini bread, for sure! Although the last time I was overwhelmed with CSA zucchinis I made zucchini butter–shredded zucchini cooked in olive oil and butter until it became soft and spreadable. That was quite delicious as well. My favorite way to eat zucchini is as nature intended..lightly blanched with butter..lots of butter, and some parmesan cheese sprinkled on top! My favorite way to eat zucchini is to fry it (spray a little cooking spray in a pan and let it cook in its own juices) with a little onion. Serve it topped in cheese. Yummy and simple! I will eat it just about any way it is cooked. I love zucchini and I love pineapple, so zucchini-pineapple bread is a no-brainer! One of my favorite recipes is http://allrecipes.com/Recipe/Summer-Squash-Bake/Detail.aspx – I do 1/2 zucchini and 1/2 yellow squash and I also throw in a few chopped tomatoes from my garden, too. It’s light and tasty! I love zucchini with pasta. Soooo yummy! I love just regular boring zucchini bread! My favorite is a zucchini-blueberry bread, really yummy!! Would be able to take lots of wonderful pictures of the bread with that lens!! I’m going right for the sweet tooth. My favorite way to eat zukes are in my Chocolate Zucchini Cake. So good! I have been wanting this lens for over a year now! I would love to win this! OOO! My favorite would have to be a zucchini bread loaded with walnuts and spices! With a penuche frosting on top… ooo. I may have to make one and post it… yum! What a sweet lens! been reading about it, looks fab! My grandmother makes a stuffed zucchini with ground beef and apricots which is very specific to Aleppo, Syria, where she is from. It’s a family recipe which according to my grandmother has never been written down, but a similar version can be found in Poupa Dweck’s book, Aromas of Aleppo. Was researching online when I came across the contest. Lenses are expensive and this would make me the best husband ever! I like zuc with squash and mushrooms on the grill. I would love to have this lens! I am currently a poor college student who needs a new lens for my photography class next semester. 🙂 Keeping my fingers crossed! I like grilled zucchini with yellow squash, onions, fresh garlic & butter or EVOO. Wrap in foil and put on the grill or just cook in a pan 🙂 Super yummy with anything! The lens is very cool, me likey…no I LOVEY! I love to make ratatouille. It is the perfect quick dish! I love to make zuchinni bread for my kids… egg free, even! We love zucchini relish, even better than cucumber relish. Ooh… simple! Zucchini roasted on the grill and drizzled with olive oil and a little bit of salt and pepper… but these boats look fun and might be thrown in the mix! That’s hard… but I do love zucchini bread. I make a quick and easy brown rice topped with garbanzo beans, zucchini and melted cheddar cheese. Everyone loves it in my family! i love zucchini fries with blue cheese dressing! We tried a zucchini salad recipe this summer, raw zucchini, cut into thin slices length wise using a vegetable peeler or mandolin. Fresh lemon juice, olive oil & basil or pesto as the dressing, topped with parm. Cheese. Yummy. Very versatile. I love zucchini coins roasted until they’re caramelized. . . I could eat a whole pan of them myself! I love Zucchini Lasagna. The zucchini replaces the pasta. It’s great. I also really like sauteing zucchini, onions and peppers with garlic and chili powder for veggie tacos. i love zucchini in all its forms, but grilled with just olive oil, salt, and pepper is the simplest way to prepare it. I’ve been looking for a new lens and I think this would be perfect! My favorite is probably just simple…zucchini cut into strips, with some olive oil, salt, pepper, and parmesan cheese and baked in the oven…yum. I love the lens!! It would be a great addition to my bag, I’ve only got primes, but need a good zoom. Nice photos! I like Korean zucchini saute, which is simply half moon shaped zucchini slices sauteed in a little garlic, sesame oil and salt. Sprinkle with toasted sesame seeds. Would love to try this lens! WOW! I love my Canon rebel…this lens would be amazing! But yes…back to zucchini! I love it, and since I’m a vegetarian I depend on it in many dishes. I really enjoy it as Zucchini Parmesan. It’s super easy and it tastes great even if you don’t use gourmet sauce or cheese. Here’s my post about your post . . .
Well we have Nikons, but what the heck. I just like to sautee it with garlic, salt, and pepper. I love zucchini bread! This dish looks so pretty! Thanks for sharing. I recently made zucchini muffins that were sooo good. I love zucchini and chocolate chips…But now I’ll have to try the boats! The lens is great…I would love to have one! Well, I’m not sure my favorite way to eat Zucchini is a recipe, but I sure do love how they stir fry it at our local Japanese Steak House. SO Yummy!! Those look so delicious, I’m adding those to the dinner queue immediately! I love sauteed zucchini as side with dinners in the summer, but one of my favorite recipes has to be the Zucchini-Pecan Cake from Bon Appetit–delish! I know these may be boring, but zucchini bread (with nuts of course!) and zucchini slices marinated with balsamic salad dressing and grilled. Mmm . . . I would LOVE the lens! It would make pics of my running children so much easier! Seriously, my favorite zucchini dish is fried with ranch … bad habit I gotta break! The lense (and the zucchini) look wonderful! I love to make chocolate zuchini bread. I would love to wn this lens. my absolute FAVORITE zucchini dish is chocolate chip zucchini muffins. YUM YUM YUM! I am a choco-holic and these things are the greatest. What a great recipe! And thanks for doing the lens giveaway! It would be really awesome to win! OK, I’m DEFINTELY trying the zucchini boats. As fort he lens…I’d love this for my hubby’s 40th!! Chocolate chip zucchini bread! YUM! Wow, love this lens. Thnx for the opportunity. My all time fav recipe is STILL bread; but also one of my favs was when I trying to lose some weight. I’d put a big batch of sliced zucchini, chopped tomatoes & fresh mushrooms in a skillet with some chicken broth & seasonings—lots of garlic, of course! YUM! Asian Zucchini Pasta! Basically, shredded length-wise with lemon, pepper, grated ginger, sesame oil and rice vinegar. Topped with black onion seeds. YUMMY!!!! My Grandma’s zucchini quiche with swiss and parmesan cheeses is the best! My Grandmas Chocolate Zucchini Bread is the best, with shredded zucchini the kiddos don’t even know what is in it. Or in the summer grilled zucchini with garlic and butter. I love zucchini grilled. Simple and healthy. Divide zucchini in quarters (middle of zucchini, then the middle again to “get to the flesh”). Heat the grill, a little olive oil on top. Sprinkle of sea salt. Freshly ground pepper. Grill the “flesh” until you see the grill marks. Eat it! I’d love to win a Tamron lens! Zucchini bread is one of my faves! And grilled zucchini w/ a little bit of lemon pepper… mmm… so good! I love real simple zucchini sauteed with some olive oil, salt and pepper. Sprinkle some parmesan on top when they are almost done and that’s it! Well I don’t have a favoriate recipe, I’m not much of a cook! I love zucchini bread…but who doesn’t?! And I love this new lens! I must have!! I love ratatouille and this is a great and healthy option. I love zucchini bread. Which reminds me that I need to make some again! I love me some chocolate zucchini cake! Oh how I would love to win the lens. Preheat oven to 375. Slice zucchini into round medallions, toss in bowl with oil, minced garlic, lemon juice. Spread on a baking sheet and season with salt and pepper to taste (just eye ball it). Cook for 8 minutes, then turn over and sprinkle with a little more salt & pepper as needed and oil, if needed. Cook for another 3 minutes, then toss with cheese and bake for final 2 minutes, allowing cheese to melt, but not burn. My favorite zucchini recipe is sliced grilled zucchini. Boring, you might say, but I love it. I’d probably love this lens even more! Oh wow! That looks delish! And I’m drooling over the lens too. 😉 I like fried zucchini, layered with red sauce and cheese! Yummy. my hubby loves zucchini! and i need that lens! I love zucchini!!! It’s like the most divers cooking ingredient of all time. But I must say my favorite dish is just good old zucchini bread!! Yum…any recipe will due!! I love friend zucchini! Yummy! I love zucchini. I just like it sauteed with a little salt and pepper. Wow! Thanks! This lens would really add to my collection. In fact it would double it. So, I only have one lens, but would love another. The pictures are amazing. Can’t wait to try the recipe. It’s yummy, a good way to use up our garden stash and so easy to make my husband will cook it! I just Giada’s recipe for fried zucchini, she uses panko breadcrumbs! Thanks! Best zucchini I think is sliced and grilled, easy and yummy! Thanks for the chance to win that lens! People will be talking about this Chocolate Zucchini Cake for years after you serve it. I love zucchini fritters preferably with feta, yum! I like to add fresh zucchini slices and oregano leaves to frozen pizza when I’m in a pinch at dinner time. It takes an otherwise drab dinner and makes it feel a little more like real food. Zucchini bread all the way!!!!! We love to cover our zucchini in marinara sauce, then sprinkle with mozerella and parmesean and broil. My kids call it pizza zucchini! I really love zucchini in place of cucumber on salad or sauteed with balsamic vinegar, olive oil and topped with feta cheese. I don’t have zucchini often, but I do enjoy them grilled with some olive oil, salt, pepper, and some paprika. I love plain grilled zucchini spears! There’s nothing better! i usually don’t like zucchini if it’s “just”zucchini .. but if it’s a blended and become soup with some cheese..
plain old sauteed zucchini is my face, especially when sauteed with bacon. YUM! I love to saute zucchini matchsticks with just a little olive oil and this seasoning blend (I know, it is kind of cheating) – we eat it all of the time with chicken & sticky rice. Zucchini bread, my favorite 🙂 I would definitely love this lens! Great for my new Nikon! I think my favorite zuke recipe is the good old standby of zucchini bread! I don’t love zucchini but what you made looks great. I also have tasted zucchini bread that wasn’t horrible. I super love that lens, by the way! Would love this lens! I have the kit lens and a larger, but it certainly is not as nice as this one! I like zucchini in matzo ball soup! My son and I love to share a chocolate and zuchinni muffin every Saturday morning at the Farmers Market. I’m inspired to make your boats … they look great! My favorite way to enjoy: Cut into matchsticks and saute with a little olive oil and garlic. Calabasita is one of my favorite Mexican dishes with zucchini as a major ingredient. My grandmother used to make this dish and it was the only way I would eat zucchini. Thanks for the opportunity to win the sweet lens! I love scalloped zucchini or chocolate zucchini bread!! Yum!! Chocolate Zucchini muffins, great way to get the family to eat veggies without the struggle. Although these boats are on the menu next week. Just like everyone else: Zucchini bread! Thanks for the giveaway! It’s a touch choice! I can’t decide between Braised White Beans with Zucchini, Potatoes, and Tomatoes and Sauteed Shredded Zucchini. I haven’t had a lot of Zucchini dishes but my all time favorite is a recipe my grandma used to bring to our holidays, it’s Zucchini bread. I’ve always loved zucchini, diced Italian tomatoes, mushrooms and onions sauteed together and simmered for about 45mins to meld the flavors. I don’t know what it’s called, but it’s yummy! Some of the simnplest things are the best – zucchini sauteed in olive oil until nicely browned with carmelized onions and salt & pepper. I love love love zucchini bread — only my grandma’s recipe will do! Every summer, my sister and I used to spend a week at her house, and we always made zucchini bread, probably because her garden was overrun with them! I love zucchini bread, but my favorite is just slightly steamed zucchini dipped in nuoc mam cham. Yum! I like a stuffed, battered, and fried zucchini. you slice the zucchini, stuff some sort of meat/herb mixture between two pieces, dip it in a batter and fry it! I love my zucchini grilled with some olive oil and seasonings brushed on. I love Fried Zucchini and Zucchini Bread! So yummy! I love zucchini bread, but have not yet found the perfect recipe to compare to the zucchini bread from a local bakery. I love zucchini sliced and wrapped in tinfoil with a little bit of butter and a whole lot of seasoning! I like to saute zucchini and summer squash with a little bit of sesame oil and some cayenne. I love how you used cinnamon and raisins in the boats. Boats are a great way to make food fun and enjoyable for kids, too. My fav zucchini recipe is a chocolate zucchini cake that Jolly Tomato made. It was so delicious and surprisingly contained quite a bit of veggies. Thanks for sharing! Fried Zucchini sticks for sure!! My favorite dish is a pasta dish I make. Spaghetti noodles, mixed with Chicken and a TON of zucchini marrinaded in Italian dressing. So good! My favorite zucchini recipe? Thin slicing it and giving the slices a light coating of oil, liberal dose of sea salt and then putting them in the oven until they crisp up. Like potato chips! MMMMM! Zucchini bread! Yum. I have a loaf in the freezer right now. honestly, you can’t beat a good roasted zucchini that’s well seasoned with a little pepper, salt, and olive oil. yummy! I love savory curry zucchini bread with sultanas! My favorite stuffed zucchini is my own version of greek stuffing. Ground turkey (browned), artichoke hearts (diced), kalamata olives(chopped), mix together place inside the hollow zucchini and top them with feta cheese. Then bake. mmmmm. Love these! Easy and so delicious – the red pepper gives it a bit of a kick that I love! In a medium bowl whisk together flour, baking powder and salt. Set aside. Combine butter and sugar together and beat until light and fluffy. Add egg and mix until incorporated. Add lemon zest and zucchini till combined. Drop by rounded teaspoon onto a parchment lined cookie sheet and bake for 13-16 minutes, or until lightly golden. In zucchini bread. Easy, delicious snack food. My favorite use of zucchini is to use it in stir fry’s….the lens looks amazing, hope it fits a D300 Nikon………. Zucchini done simple is my favorite. Just cut into slabs, toss with olive oil and grill. A few grinds of black pepper and a pinch of kosher salt. with tuna and onions, it’s great! My favorite zucchini recipe is zucchini basil soup. It is especially good with fresh vegetables from our local CSA! Definitely zucchini planks rubbed with salt, pepper and cumin with a sprinkle of ketjap manis (thick indonesian soy sauce) and oil then cooked on the BBQ grill. Preheat oven to 350 degrees. Butter and flour a 9-by-5 loaf pan. In a mixer fitted with the paddle attachment, whip together the sugar and canola oil on medium speed for about 1 minute. Add the eggs and mix until creamy, another 2 minutes, then stir in the vanilla. In another bowl, whisk the dry ingredients (flour, baking soda, baking powder, salt, and cinnamon) together. Add the dry ingredients to the egg mixture and mix on low speed until just combined, scraping the sides of the bowl with a spatula if necessary. 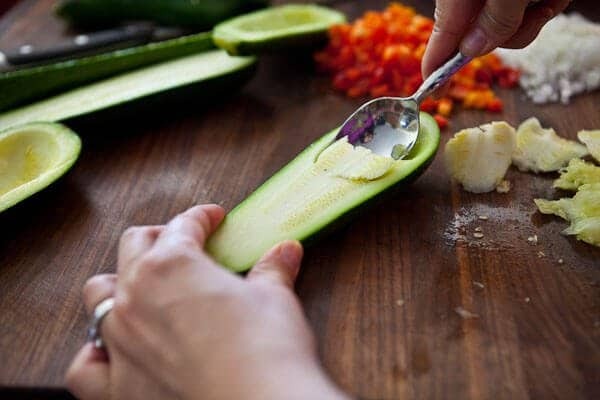 Fold in zucchini and walnuts using a spatula or wooden spoon. Pour the batter into the prepared loaf pan. Bake the bread for approximately 1 hour, or until a toothpick inserted into the center comes out clean. Cool in the pan for 10 to 15 minutes. Remove bread from the pan and complete cooling on a wire rack. Slice and enjoy! For tasty variations on this recipe, in place of zucchini and walnuts use sweet potatoes and hazelnuts; mashed, ripe bananas and chocolate chips; or carrots and pecans. Cardamom can replace cinnamon in any combination. Great giveaway! My favorite zuchini dish is simple. Olive oil, garlic and soy and then BBQ for 2 minutes on each side. YUM. I drool over Zucchini Succotash or maybe I just drool over Bobby or maybe because saying the word Succotash is so fun. A zucchini quiche with mustard spread on the pastry, then the zucchini, cheese and egg. Yum! My absolute favorite zucchini recipe is super simple: a bit of olive oil and kosher salt, then grilled. Yum! Hard choice. Either zucchini mint soup or on pizza. I’m going to have to go with zucchini bread- my recipe has walnuts in it & they get baked to that perfect point between chewy & crunchy. I also love “squash mush” though which has a hefty helping of zucchini in it. When we were kids camping, a neighbor camper turned us onto slicing zuchinni, dipping in cornmeal, and frying (in Crisco, of course). Oh, my! While I rarely make this treat, it always brings me back to camping in Myrtle Beach and the family we met that summer. I love my zucchini the way my mom makes it… baked in the oven with salt and Parmesan. Simple and yummy. And that LENS!! I am loving that, and have been shopping around for something similar! It would be perfect right now. I love zucchini, but the hubby doesn’t so I use it for muffins and bread. Love, love, love, zucchini, but most especially sliced thin in an omlette with some melted cheddar. Zucchini bread with chocolate chips and walnuts is my favorite! Or brushed with olive oil and grilled. But I would eat zucchini just about any way; it is one of my very favorite veges. The stuffed Zucchini looks so good! I bought your book recently on Amazon and am so impressed, both with the pics that you take and the phenomenal recipes! I launched my kosher cooking site about 2 months ago. I live in Boca Raton and would love to attend any Blog seminars that you give in the near future. I bought a Cannon rebel EOS and love the pics that I have been taking near natural light like on my front porch or by my living room window. Unfortunately my kitchen has almost no natural light and the pics that I have taken while cooking are not so great. I saw your light box recommendation and am interested if you still feel that is best for stills, however, I would like to take some cooking shots in the kitchen, any ideas or tips? I make a carrot cake recipe that has more zucchini in it than carrots- so moist and delicious with cream cheese frosting! My favorite use of zucchini is very simple especially I get home from work late and have to fix up a quick side dish. I normally slice them about an inch thick and sautee them in olive oil and salt and pepper. Other times I cube them and stir fry with chicken and mushrooms. Simple baked zucchini. Scored and topped with salt, pepper, oil, and parmesan. I love to make chocolate chip zucchini muffins with almond flour instead of wheat flour. Healthy snack!! Zucchini bread gets my vote. Other than that, I really like it sauteed with onions in a little butter and olive oil with salt and pepper. If it’s really fresh zucchini, you can’t beat this for a simple side dish. This looks yummy, I’ll have to try it next week! My favorite zucchini dish is a Zucchini Cheese Garli appetizer, it’s soooooo yummy! The best part is that it gets the “good stuff” into the little ones with them begging for more. 2. In a mixing bowl, combine the zucchini, biscuit baking mix, Parmesan, Cheddar, eggs, vegetable oil, onion, garlic, parsley, salt and oregano. Spread the mixture into a greased 9×13 inch baking pan and bake 25 to 30 minutes, until golden brown. 3. Allow the mixture to cool. Cut into small squares and serve warm or cold. Zucchini is also great because I can use a hand blender to make it into purees for my baby. It’s great with squash and cheese and there are a few great tomato sauce/zucchini recipes too. We use a lot of it in our house! I also take photos of everything I make, so I’d be ecstatic to win the lens! I just started in photography with a Canon Rebel, I’ve bought a tripod and bag and the Canon 50mm 1.8, now I need a zoom lens! I’ve heard the Tamron’s are great and would love to try one out! I like simple. Stirred fried with a garlic, oyster sauce, w pepper and sesame oil. Oh, YUMM! That looks delish. Hrm, my favorite? I love picking fresh zucchinis from the garden, slicing it up, and frying it in a nice light batter. Also, this veggie dish my mom and grandma make: take strips of cleaned zucchini, mix with salt, a bit of sesame oil and top with sesame seeds–yarm! I just made Ratatouille. I love how the zuchini and the other vegetables bring a sweet taste to the dish. I love zucchini, it’s great to add into things as a filler or to make zucchini boats, but I have to say my favorite way to use it is fried zucchini with a bit of ranch dipping sauce, mmmm! Awesome idea!…My old favorite was enjoying some homemade zucchini bread that my mom used to make! Thanks for the recipe, look forward to trying this out ASAP! I love the zucchini cake recipe that Ree featured on Pioneer Woman last year. I love fried zucchini with some buttermilk ranch dipping sauce! My favorite zucchini recipe has got to be my mom’s zucchini bread. Adding a little apricot jam makes it especially delish too! I love simple grilled zucchini but if the above recipe tastes as good as it looks I might have a new favorite! I make a similar dish to this but use rice instead of meat, I will definitely try this version, sound delicious!! Huge fan of a basic zucchini bread! A friend let me borrow this lens a few weeks ago and I fell in love. My favorite way to use Zucchini is in soups–lots of different soups. I love bread and butter pickled zucchini and yellow squash mix! Yum! I enjoy fried zucchini/carrot/onion bundles. Yum! I just toss 1/2″ slices of zucchini and 1/2″ slices of onion in a really hot wok with some oil and cook until there’s some dark blistering on the veg surfaces (that’s the tasty part!) and just before they’re done I splash a little soy sauce over the top and keep stirring like mad for a minute or 2. It’s so yummy! There should still be some crunch left in the middle of the zuc. I have lens envy. That would be a super one to have for my Rebel! Zucchini blondies! Vegetable plus dessert all-in-one! My favorite zucchini dish is my mother-in-laws recipe for chocolate zucchini cake. Mmmmm. I would love to try that lens! 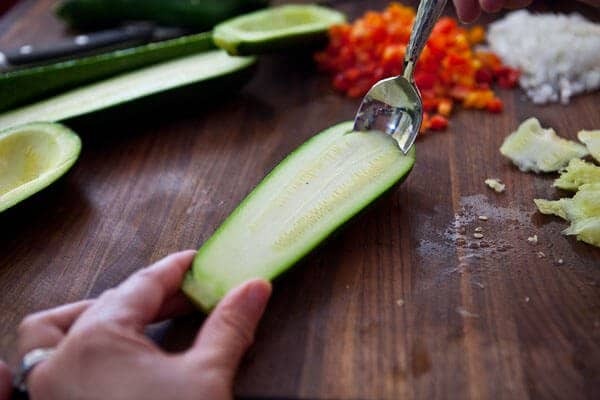 2.Wash and trim zucchini and cut a thin slice along the middle of each. 3.Insert a few cream cheese slices into each zucchini. 4.Sprinkle zucchini with lemon pepper seasoning and 1 tsp olive oil. 5.Cut out 4 rectangles of aluminum foil and brush with remaining olive oil. 6.Wrap each zucchini in foil, place on baking sheet and bake for 20 minutes. 7.Remove from oven and sprinkle with bread crumbs. 8.Bake for additional 3-5 minutes. Zucchini is one of my favorite foods so it’s hard to pick, but my grandmother’s zucchini casserole and zucchini muffins are always at the top of the list. My favorite way to cook zucchini is to brush it with a little garlic EVOO and grill it! I could eat it this way every night-which is good since we all know what happens when you have zucchini in your garden! My favorite zucchini recipe is from Everyday Food- take the zucchini and slice it longways. Roast in oven w/ olive oil, salt/pepper. Then toss with linguine, lemon zest, lemon juice, and top with ricotta. Yum! I’m with Selena on deep-fried zucchini, but I also like to take a slice or two and add it to any ice cold pitcher of water, it makes it crisp and refreshing – learned this in Madrid! I love battered, deep-fried zucchini but I never make it at home. Usually, I steam zucchini with carrots, summer squash, and broccoli and then toss it all with a little butter, salt, and pepper. I love sauteed zucchini in everything and would eat it every day if possible. I recently made a stuffed zucchini, using one monster zucchini that had escaped my attention in the garden. I put it in a pyrex casserole and covered it with foil, then baked it for about 35 minutes at 350 degrees F.
After that I removed the foil, sprinkled the top with parmesan and browned it another 10 minutes. One of the halves was a HUGE hit as a side dish with dinner that night! And two days later, my girlfriend and I made a lovely lunch out of the remaining half – very yummy! I just love it grilled! I love fried zucchini spears dipped in ranch dressing, but I love zucchini cooked any type of way! I like to keep it simple — slice them thin, toss them in a pan with olive oil, salt and pepper, saute until they are just soft, and sprinkle with cheese. I like zucchini cream soup…but your recipe looks really yummy…Must try this!! Zucchini Fritters is one of my fave. I normally serve these savory fritters with garlicky yogurt sauce…. My favorite zucchini recipe is from PW’s site. I absolutely love zucchini bread – it’s a staple in our house! It isn’t summer at my home without grilled zucchini. Brushed with olive oil and seasoned with any of the dozens of dry rubs I have in my waaaaay overstocked spice cabinet, or with a simple toss in kosher salt and cracked black pepper. Grew up with grandparents who farmed, so I was one of those weird kids who grew up loving zucchini (and every other vegetable under the sun). Zucchini fritters – my Italian grandmother used to make them. Shred some zucchini on your cheese grater, then mix it with an egg, a handful of grated Romano cheese, and enough flour to make a batter of the consistency appropriate for fluffy pancakes. Shallow fry spoonfuls in extra virgin olive oil, sprinkle with salt, and enjoy. My favorite zucchini dish is pretty boring–I just slice it, brush with olive oil and salt, and grill until charred. It comes out incredibly sweet and flavorful this way. I love a good curry with zucchini and chickpeas, scooped up with parathas! Spirulized zucchini pasta with homemade sauce! Wow! There are so many great recipes in the comments here, how could I pick only one? Grilled zucchini, zucchini bread, hobak jeon (sounds amazing,) zucchini soup, fritters. What a versatile and delicious vegetable! I’m going to try the hobak jeon, and maybe take some photos with a new lens? Tomatoes with Zucchini and yellow squash. Yum! It may seem silly, but my favorite everyday recipe is small zukes fresh from the garden (they are so much more tender than store bought), sliced and steamed with a touch of butter. The kids who always turned their noses up at the stuff from the store, even when we took off the skin, gobble them up when they come from the garden. I do like the traditional stuffed zucchini with parmesan and the various breads as well but most of the time those are less about the veggie and more about the other goodies. This lens has been on my “want, want, want!” list for a long time. I would love to have it for travel. As for zucchini dishes I have a couple favorites. My favorite zucchini recipe is to chop onions, bacon and garlic and saute them in a cast iron skillet. Then you add chopped/small cubed zucchini to it with a can of chopped tomatoes. You let it cook till very done and it thickens. With the bacon the stuff is incredible. Chocolate zucchini muffins for sure! My Aunt’s Zucchini cake is to die for. Amaaazing Chocolate cake1 Yum yum! I love grilled zucchini, topped with a little parmesan cheese. So simple, but so good! I also can’t resist making fried zucchini at least once in the summer. I love making a herbed zucchini and sweet potato au gratin. Perfect for the fall! Fried zuchinni chips with tzatziki or another greek dip is fantastic. saute in olive oil, finely chopped garlic, chopped onions and salt and pepper. Add a can of tomato sauce not paste, but sauce plus a can of water (fill the tomato sauce can and pour in). This should be a small 8oz can. Cover and simmer until zucchini is cooked to your taste. There are virtually no calories and this is DELICIOUS! Yummy! The dish and the lens 🙂 My favorite Zucchini dish would have to Zucchini loaf – to die for! Simple grilled zucchini with olive oil salt and pepper! Could eat with every meal! I am avid scrapbooker and take about 200 pics a month some times more! I know this is overly simple, but I LOVE grilled zucchini, rubbed with olive oil,salt and pepper. Sometimes a squeeze a little lemon on top. So good. So simple. I’m a sucker for zucchini muffins. Yum!! You know, I really just love zucchini best when it’s been grilled outside on a bbq with some salt and pepper. That’s it. smitten kitchen’s zucchini gallette is my FAVORITE. it is awesome. I love zucchini sauteed with some butter onions and a pinch of salt.Thats how my mom made it for 40yrs.I try all different ways. My second favorite is grilled with olive oil and some spices. Zucchini bread! But it has to be heavily spiced(but then again, anything I make does too) and topped with cream cheese frosting. Maybe that makes it a cake… but bread sounds healthier 😀 Yum! Just the photos of the zucchini boats were fascinating my son. For some reason he thought it was hilarious that they were “boats!” I’ll have to try these, looks like they could beat out my Mom’s zucchini bread as my very favorite. Also – swoooon on that fantastic lens. I am usually a prime gal (50mm 1.8 and a new 1.4) but oh my, what I would do for that one! My favorite way to eat zucchini is just lightly sauteed in a little oil, and sprinkled with salt and pepper and parmesan cheese! My favorite Zucchini recipe is simple…sauteed zucchini and squash with red onion, sesame seeds, and olive oil. Dash a little salt and pepper…yummy! I like to roast zucchini and yellow squash! Vegetable candy! As boring as it may sound, I love a simple sauteed zucchini, preferably using fresh ones from the garden! I slice them really thin, and then in batches I saute them in olive oil over a medium low heat until they are soft and slightly browned. Season with salt and pepper, and voile! It’s so simple, but the flavor when sauted is so delicious. zucchini cake – it’s practically a vegetable! Zucchini cakes – like zucchini latkes! i haven’t tried too many zucchini recipes…but of the ones i’ve tried…i really like zucchini pancakes! your zucchini recipe looks fantastic! i think i will have to try it this weekend! Thanks for the recipe & the giveaway! My other standby favorite when I have a ton of zucchini on hand is zucchini quick bread. YUM. Zucchini bread and grilled zucchini! I just told my husband last night that I need a good macro lens for my camera and then I hop online this morning to see this! In the summer, nothing beats simple grilled zucchini. As fall approaches, must make zucchini bread. Zucchini au gratin!!! Creamy and delicious, second favorite, just sliced and steamed with salt and pepper!!! Frosting is optional on this rich, moist recipe. 1. Preheat over to 350F. 2. Mix all ingredients until blended. 3. Pour into 13×9” pan. 5. Cool and frost (if desired). Zuchinni bread, hands down 🙂 With or without chocolate chips, I’m not picky. The only thing I have ever really done with zucchini is make bread….and I love zucchini bread! In the summer, during the grilling season, I cut a zucchini in half, then make slices on the bias so they’re big enough to not worry so much about ’em sliding through the grates. A short dunk in an olive oil, balsamic vinegar, kosher salt and black pepper marinade, on to the grill for a few minutes, flip ’em, couple minutes more, then back into the dressing for a quick toss before going onto a plate. I do the same with asparagus (except for the cutting, I leave asparagus whole), yellow squash… It’s quick, easy, goes well with just about anything I’m grilling. i have been trying to decide which new lense would be right for me. this just might be it. i love the idea of zoom and close up in one. i have a wonderful recipe for roasted veges with orzo. lots of olive oil and garlic. i am making it this weekend and adding the zucchini with the eggplant, peppers and onions sounds amazing. thanks for the inspiration. I love to just slice it thin and sautee in olive oil with a little basil, salt, and pepper. Yummy!! Hmmmm… maybe I can trick my hubby and three little turkeys into eaing zuc. this way! I usually trick them by making the zuchinni into relish and canning it. It’s a good way to use up all the extra when we are tired of hiding it in every other dish possible. Also, when you discover a HUGE zuc. in the garden that you missed you can still shred it up and use it in the relish. I usually shred it as we pick them all Summer long and dump the shredded zuc. in ziplocks and poke ’em in the freezer. Then in the Fall I have a lot to make into a great big batch of sweet zuc. relish. My mom and I have a big canning party and get it all put up to last until the next year’s harvest. My favorite zucchini recipe isn’t really a recipe at all! I just love throwing them on the grill with some garlic, olive oil, salt and pepper! Just be careful not to let them fall through the cracks if you have a charcoal grill – that’s a surefire way to end the evening having to eat your roommate’s leftover mac and cheese. These sound perfect – definitely going to have to try them! Favorite zucchini dish? Well, right now it’s a basil and pistachio zucchini salad. First love though is stuffed zucchini!! Chocolate zucchini cake has long been a staple in our house and is a family favorite. While I love it in its green state, grilled, sautéed or fried, something magical happens when you blend it with chocolate! Sauteed Zucchini with rosemary and orange juice. It’s the perfect side for summer and late fall dishes and works well with Chicken and Pork. My favorite Zucchini recipe has to be either zucchini latkes or zucchini blossoms stuffed with goat cheese and deep fried! Mmmmm! I love zuchinni just sauteed in butter and olive oil with some onions and maybe some fresh herbs. Simple and delicious. My friend’s zuchhini and squash casserole. Haven’t had it in years. bi bim bap with zucchini! I love zucchini sauteed with olive oil, onions, and tomatoes. Add some S&P and little parm, and I’m in summer heaven! Pasta with Zucchini, Bacon and Parmesan!!! So rich and perfect for the winter. Cook the pasta in boiling, salted water to al dente. Drain the pasta, reserving 1 cup of the cooking water. Return the pasta to the pot and set aside. In a large saute pan, add the bacon and cook until the fat is rendered and the bacon is crispy. Add the zucchini and cook until it starts to soften. Place the cooked pasta over low heat. Add the reserved pasta water, cooked bacon, zucchini and the grated cheese. Toss to combine. Season with salt and pepper. Taste and adjust seasonings. Serve immediately. I love to make stuffed ball zucchini – when I can find them at the farmers market. 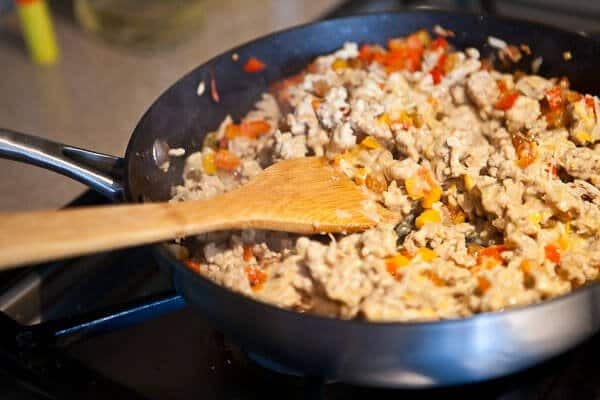 With chicken sausage, rice, cheese and tomato sauce – delicious! I love the good old fashioned zucchini fries! I love to make zucchini noodles to use in place of pasta. I just use a vegetable peeler to make long ribbons and then saute in olive oil, garlic, and salt. Great with a bolognese sauce. my very own Zuccini curry, with cumin and curry powder tastes great and love it. Olive Oil, salt and pepper, and put on the grill. mmmmmm. My favorite zucchini recipe is Zucchini Pie. Make it just like an apple pie but use zucchini instead of apples. Yummy!!!! I often enjoy a simple quick saute of zucchini & apples, sometimes with caramelized onions included. I love roasted zucchini with other roasted vegetables and quinoa. Simple and amazing. My favorite thing to do is make Zucchini Bread – when I got my first Cuisinart food processor it came with a recipe and I still use it and love it! Prepare baking pans i.e. grease and flour loaf pans…I use smaller ones because they make excellent gifts. Wash, peel, remove seeds and cut into large chunks; place in Cuisinart processor to pulp. In large mixing bowl, combine and mix all ingredients listed. Bake at 350 degrees for 45 minutes or until golden brown. I love using zucchini! Can’t wait to try this recipe – sounds delicious and looks beautiful. Here’s one of our favorite ways to eat zucchini – from Moosewood Restaurant Low-Fat Favorites! Cut the zucchini lengthwise into 4-6 wedges, then cross-wise into 3″ pieces. Steam the zucchini, either in the microwave or in a steamer basket, until crisp-tender. Meanwhile, in a serving bowl, whisk together the remaining ingredients. Toss in the steamed zucchini. Serve immediately or at room temperature. I like zucchini best raw in a salad! I made some great zucchini chocolate chip cookies not too long ago. I have my grandmas zucchini bread recipe… it’s the BEST! Mines similar to yours since it requires the “boats”. Basically create the zucchini boats and fill with diced black olives, tomatoes, feta and a bit of basil. Drizzle with olive oil and add a touch of pepper and grill. So tasty and reminds me of long summer days! I love zucchini… my MIL makes an asian inpsired dish that has matchstick cut zucchini that is stir-fried with soy sauce (and a couple of other things I can’t remember)… tossed with slivered almonds… it’s so good! She even serves it at holiday meals! I like zucchini sliced fresh in a salad, in place of cucumber. Pine nuts – the perfect topping for this! I’m crazy about Turkish style zucchini fritters made with mint and a little beyaz peynir (feta). Sooo good for breakfast! I like zucchini shaved raw, tossed with shaved parmesan and toasted pine nuts, and dressed with olive oil and lemon. Simple. My favorite disk is one that my mom makes. It is zucchini bread. Freshly process zucchini from the garden along with walnuts and made into bread. Delicious! It never really had a name except for “that zucchini in the wok” but my mom used to cut zucchini into thick sticks, and she would stir fry them in her wok with garlic and worcestershire sauce and they were perfect. She knew how to do them just the right amount of time that they were really tender but not soggy. They were yummy. Zucchini sauteed with butter and breadcrumbs. Keep it simple! I love Pastor Ryan’s Zucchini Cakes! Yum! It has to be zucchini and pineapple bread! 1.Combine flour, baking powder, baking soda, and salt. 2.In a large bowl, mix oil, eggs, vanilla, sugar, cinnamon, and nutmeg. Blend in pineapple and zucchini. Stir flour mixture into zucchini mixture. Pour batter into two greased and floured 9 x 5 inch loaf pans. 3.Bake at 350 degrees F (175 degrees C) for 1 hour. Cool on wire racks. I LOVE zucchini fritters! With a shot of hot sauce on top. I love using zucchini as noodles in pasta. Just slice with a potato peeler and pile on the toppings! My very favorite way to eat zucchini is to brush it with oil, throw some seasoning on it and grill it – so simple and pure! I have had my eye on this lens – it’s beautiful!! Thanks!!! WOW! I wish I could grow zucchini. This season I only got two zucchini, I made bread. Wish I wouldhave seen this recipe first! I love baking zucchini bread. The bread is somehow more moist than usual. Zucchini bread topped with cream cheese icing is a favorite in our house. I’ll have to go with zucchini bread! My mom’s zucchini bread. It always reminds me of the end of summer. I’m a purist– I like zucchini drizzled in olive oil with a little salt and pepper and chunks of vidalia onion roasted in the oven! My favorite zucchini recipe is one my grandma made – grate it on the large holes of a box grater. Squeeze in a towel to drain. Also grate one Vidalia onion into the towel and squeeze to drain. Stir in a melted compound butter of butter, rosemary, thyme and garlic and one egg. Spread in a baking dish and top with bread crumbs. Drizzle the compound butter over top and bake. SOOOO good! I do like some hobakjeon (Korean-style zucchini egg-flour fritters). Can you say most perfect lens ever?!?! I just got the 50mm 1.8 for my Rebel and am looking forward to playing with it this weekend, but this is obviously one million times better! My favorite way to eat zucchini is to grill it. Little olive oil, salt and pepper, that’s it. Yummmmm. I grew up with pounds upon pounds of zucchini from my mom’s garden so picking one recipe is hard! I would have to say that right now, I really love a good chocolate zucchini bread or muffin. So moist and amazing! I once made this zucchini cream soup, and it was delicious! Just chicken broth and cream and sauteed onions and cooked zucchini, then blended. i love zucchini baked on the over with a little olive oil, salt, pepper and parmesan cheese! I love zucchini cake! So yummy and I can pretend it’s healthy.